Jan – Mar 2008 – John returns to the Federal Building and is accused of violating a Court Order for writing “I LOVE YOU DOM” and “SEN CLINTON HELP US” with kid’s chalk on the ground outside the building. He is tried by US Magistrate David Peebles and found guilty. John argues that there was no criminal intent — that his was a sincere Civil Rights effort. You can read the entire transcript here. 2/24/06 – Plans are now being made to resume our efforts with Senator Clinton . We may hopefully have more influence as she runs for reelection in New York. Check our list message for more details. 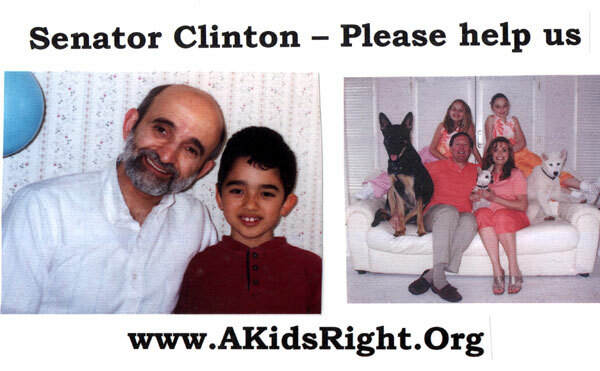 Anyone who wishes to get involved please contact John directly (jmurtari@AKidsRight.Org). Who are We & What do we want? Basic questions that need to be answered before any Civil Rights movement matures. Here’s a thought: We are not the Mothers-4-This or the Fathers-against-That or the Victims-of-Child-Protective-Services. We are ALL parents. I don’t know about you, but personally, I can’t get excited about a rebuttable presumption of shared parenting? I fall asleep after reading the sixth paragraph of exceptions. I don’t think the fix is giving the Social Workers from Child Protective Service better training and better supervision. Maybe more sensitivity training? If we are leaders (and followers) we need to make sure our goal is BIG enough. Paragraph after paragraph of legal mumbo-jumbo does not a Civil Right make. Good, Average, or Poor — we are Fit & Equal parents. Before a Court can intervene between us & our children we must first be convicted, in a criminal court, and with the protection of the unanimous verdict of a jury — of demonstrated conduct that was a serious threat to the safety of our kids. That we are a ‘Bad’ Parent. A hurdle —Good, Average, or Poor — are we Fit & Equal parents? Can it be the real problem is we don’t accept this. We don’t really want to be equal with the OTHER parent. It really would be BEST for MY child, if I had primary control. Really, it would! My complaint is not really with the system, just the result….they didn’t pick me! How pitiful are we? 1/29/05 – John Murtari’s mother, Caterina Murtari, passed away at home at the age of 89. With the help of Hospice aids & nurses John was able to take care of her at home. She was in pretty good condition over Christmas and was able to celebrate with family and with her Grandson, Domenic. Her funeral will be celebrated in Lyons, NY, on Saturday, 4 Feb. Here is a copy of the Funeral Program that Domenic first designed. More about her. 11/29/05 – Update to below – John has had to suspend his efforts in Syracuse due to his mother’s illness. Anyone who wishes to get involved please contact John directly (jmurtari@AKidsRight.Org). John is also involved with renewed legal activity regarding Child Support and is involved in NonViolent Action regarding a local traffic ticket. (traffic_jm, Follow the links for more detail). 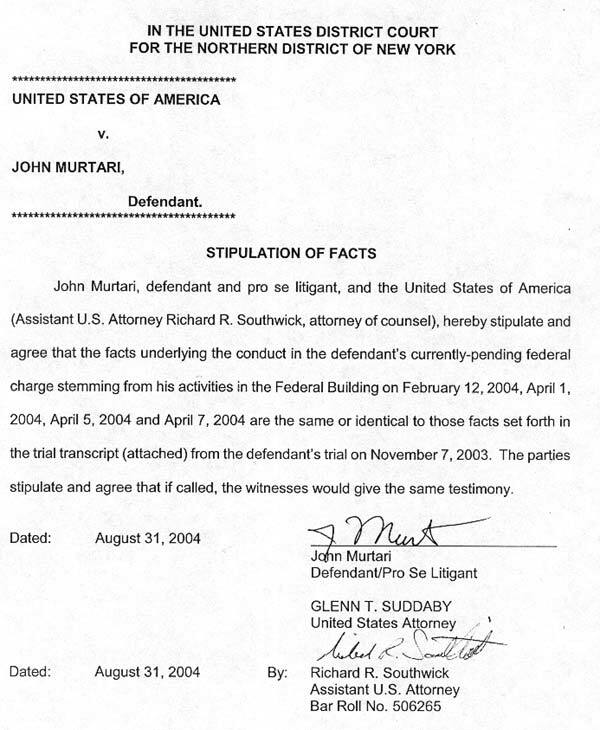 10/9/05 – John Murtari, group coordinator, has been interrupted in planned activities at the Syracuse Federal Building. His mom, Caterina, is 89 years old but has encountered some serious health issues. Two trips to the emergency room in August and September, and almost two weeks in the hospital. John’s dad, Domenico, died back in 1989 (age 97), and John is the only child. Because of failing liver function the diagnosis for his mom is terminal and John is caring for her at home (he is lucky to be able to work from home). The Hospice Program (for those with terminal illness) has been great in offering aid support at home along with visiting nurses. There is still hope for a recovery and her condition and spirits have certainly improved since she came home. For an ‘old’ link that has a picture of the Family. Thanks for your thoughts and prayers! 8/31/05 – John Murtari’s mother has been ill the last week and some plans have been delayed. An infection caused a trip to the Emergency Room, but she is slowly improving. 8/25/05 – (Syracuse/Washington DC) Ron did visit the DC offices of Senator Clinton and John was at the Syracuse Federal Building. Unfortunately, we had no other participants. Please plane on joining us between 2-3 PM for a public gathering. Ron Jagannathan of the Washington, DC, area is also ready to help parents visit Senator Clinton’s offices. The date/time would be the same, Thursday afternoon. Ron’s email address is: ron.jagannathan@gmail.com If you plan on making the trip, please write a two page summary of your ‘story’ and include a color photographs of you and your kids. Make three copies and you can drop it off not only with the staff of Senator Clinton, but also with Senator Schumer, and Congressman James Walsh (all have offices in the Syracuse building and are aware of our issues). If visiting Washington offices you may also be able to drop by your Senator’s and Representative’s offices. 8/22/05 – John returned to the building at 10 AM. Climbed the sculpture again and remained there until 11 AM. No arrest occurred. 8/18/05 – At 2 PM John Murtari climbed the 20 foot sculpture in the Federal Plaza. He unfurled a banner and also carried pictures of various parents and children. The message was “Senator Clinton – Please help us!” Click here to read a news release. He came down voluntarily from the sculpture after about 90 minutes and was arrested. He was not charged with any offense by Federal authorities, but was turned over to the Syracuse City Police. He was given a ticket for ‘trespass’ and released at the building. Check here for full details on what happened and how you can help! Over the next weeks more activity is planned. Your presence is welcome as a spectator and also by making a personal visit to Congressional offices in the building. Please contact John directly if you can help (877-635-1968,x-211). 8/16/05 – The US Attorney’s office files their reply (page 1, page 2, page 3, page 4) to an earlier Motion made by John. On August 5th, he had submitted a motion to Magistrate DiBianco (click here for text) asking for the pending charges to be dismissed and for protection from being blocked from entering the building. August 2005 – The effort to get a meeting with Senator Clinton will continue (first time visitors please review the extensive BLOG below on what has happened). In recent months John has been improperly ‘blocked’ from even attempting to enter the building to petition his Senator regarding Civil Rights. Efforts on the outside of the building have been stopped by Federal authorities willing to designate considerable man power to stopping John’s efforts to avoid any arrest (review activity below). Take a gallon of Sear’s Best High Gloss Enamel, a nice bright red color, and write ‘Senator Clinton – Please help us!” Do this in the plaza of the Syracuse Federal Building in brush strokes big enough to be read from the 14th floor — where her local office is located. What will be the result? … read rest of message. 8/15/05 – John arrived at the Federal building a 2PM, there were no other parents present. At 2:15 he entered the building and was allowed through security. He had just arrived on the 14th floor when he was met by two Federal Police officers. They were surprised he had gotten inside. They asked him what his plans were. He said he was there to ‘petition his Senator for reform.’ They told him ‘you know you can’t do that’ and forced him out of the building as before. We certainly hope we are the next GREAT Civil Rights movement. We have visited legislators for years, but it is hard to get traction on our issues. Our immediate goal is a local meeting between parents and Senator Clinton and I have attached a draft Agenda to this letter. I certainly understand that we may seem to represent a minor issue. At present we are not well organized, nor do we have a lot of political capital in the form of funding or large public demonstrations. 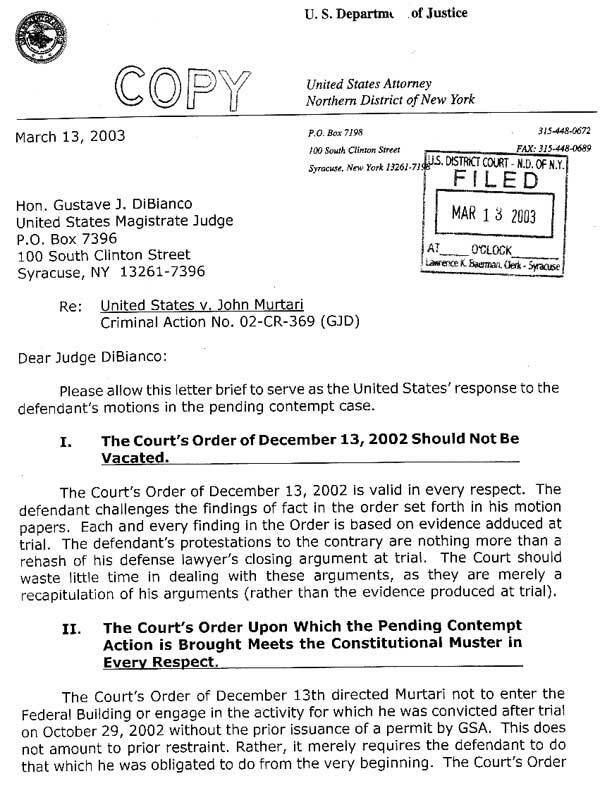 8/5/05 – John submits the motion to Magistrate DiBianco, click here for text. 7/30/05 – Vacation is over. John’s family is thankful there was no interference with his vacation plans by a pending trial in Federal Court (arraigned on May 18th – see below). He sends a Thank You letter and pictures to the Judge and Prosecutor. 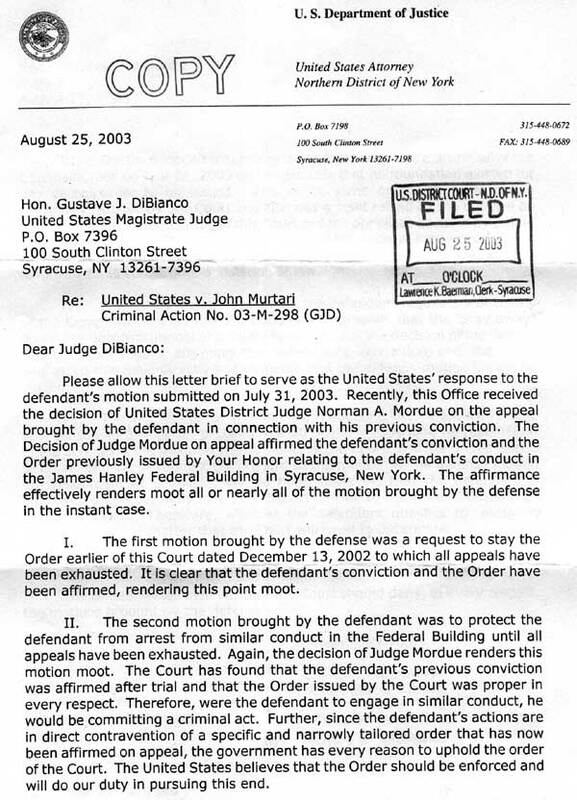 7/26/05 – John plans on submitting a motion to Magistrate DiBianco in an attempt to get a restrictive order vacated, or to stop authorities from using physical force to block John from entering the building. He will try to enter the building at 2pm on the 15th and hopes to be allowed to continue (your presence is welcome and will help send a message of support to the Senator). If he is again blocked at the door, after discussion, the plan will be to do some ‘unannounced’ (but as always peaceful & NonViolent) activities outside the building. This effort has been going on for years and it is time for that meeting with the Senator. To show our faith in the power of NonViolent Action to help bring Civil Rights protection to families. I’m willing to be involved in peaceful action that might result in a jail sentence of months — your support by way of calling/writing the Senator is welcome! I find it most objectionable that a person asking for Civil Rights protections is ‘pushed away’ by security officers from approaching their US Senator, but is not charged with any offense. SUMMER VACATION – John Murtari, Group coordinator, has a six week vacation period with his son, Domenic, from June 10 to July 23. Other than for the Friday before Father’s Day, there are no activities planned for Syracuse. June 17th (Friday before Father’s Day) (CANCELLED, no participants) – We hope to get a nice group of Moms and Dads to the Federal Building to help Senator Clinton see how important reform is. Please bring a brief (two page) summary of what the “system” did to your family. Make sure to include a color picture of you and your kids. As a group we will drop those off at the Senator’s offices on the 14th floor. We will then return to the Federal Plaza and those who wish can take come children’s chalk and write “I LOVE YOU” to their kids and “Sen. Clinton – Help Us!” on the ground. We hope to fill the Plaza with heartfelt messages and have a repeat of TV coverage from a prior event (click here for video). A proposed agenda for our meeting with Senator Clinton. June 7th, 2005 – John reports to the US Attorneys office in response to a FINANCIAL deposition order of May 6th. The deposition is conducted by three people from the Department of Justice, Mr. William Pease, Chief Attorney of the Civil Division, Mr. Richard Southwick, US Attorney prosecuting John, and a paralegal that had reviewed the financial material. Their is also a Court reporter present to produce a transcript. It takes approximately two hours. Besides extensive financial records, John also completed a summary worksheet of his family finances. No hidden assets or mis-reports were found and it was uneventful. 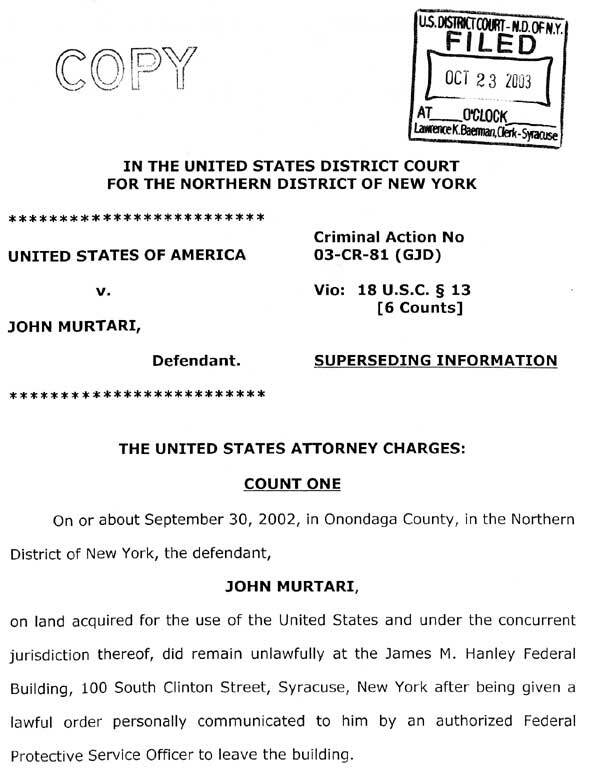 May 18th, 2005 – John Murtari will be arraigned Wed (May 18) in Federal Court for the Northern District of New York (Syracuse) at 9:30AM. He will be charged with ‘destruction of government property’ for attempting to write “Dom I Love You – Senator Clinton, Please help us!” with chalk on the side of a Federal Building. Your attendance is welcome. The court appearance results in tentative plans that might result in trial being scheduled right in the middle of John’s summer vacation with his son. He sends a quick message to the US Attorney. Later that same day he sends a pleading letter to the US Magistrate. May 6th – John had an unpaid $500 fine to the Federal Government. Earlier in the Spring he had completed a financial statement for the US Attorney’s office. He now received a letter notifying him of a deposition regarding his finances and requiring more financial disclosure. May 6th (Friday before Mother’s Day) – We had hoped to get a nice group of Moms and Dads to the Federal Building to help Senator Clinton see how important reform is. Unfortunately, we only had one person turn out. If you have been on the list for a while you know the number of FEEDBACK messages that have ‘skewered’ Senator Clinton for not caring about reform — but what can we seriously expect when we don’t show ourselves? 4/26/05 & 4/28/05 – On 4/26 John returned to the Federal Building at 2 pm to stand in quiet petition. He also wrote on the ground using kid’s chalk in a couple of locations on the Federal Plaza: “Dom I Love You – Sen. Clinton Help Us”. He returned again on the 28th and when building security saw him starting to write, they took his chalk on two occasions. 4/21/05 – John returned to the Federal Building at 2 pm to stand in quiet petition. He also wrote on the ground using kid’s chalk in a couple of locations on the Federal Plaza: “Dom I Love You – Sen. Clinton Help Us”. About 10 minutes later a building maintenance person came out with a bucket of water and cleaned off the writing. A while after that John wrote the same message in a couple of more places with chalk. He left about 40 minutes later. The messages were still there. 4/13/05, 4/14/05, 4/15/05, 4/18/05 – Effort scheduled to resume. John plans on returning to the Federal Building each day at 2 pm. He will first try to enter the building carrying our petition for the Senator’s help (see below, he has been blocked from entering in the past). If not allowed entry he plans on writing “Dom I Love You – Sen. Clinton Help Us” on the outside wall. Check here for updates. Your participation and presence is welcome! NOTE: The sequence below is unusual in that John was not arrested at that moment. Obviously, officials still have the option of charging him on these activities at a later date. John went to the building on the 13th and was denied entry to ‘petition Senator Clinton for reform’. He then walked around the side of the building and had just finished writing “Dom I Love You” with chalk when two Federal police officers approached him and took the chalk from him. One of the officers then frisked him for more chalk. They took a picture of the wall. He was then told he was free to go. He was not arrested. He then walked around another corner of the building and started writing again with chalk and got as far as, “Dom I Love You, Senator Clinton Help” when the two officers approached again, took his chalk, frisked him, took a picture, and then said he was free to go. John walked away from the building to pick up more chalk he had left on the street. John then returned and started writing the same message again on a wall near a walkway to the building. The two officers then returned and the sequence was repeated. At that point John left. He plans on returning according to the schedule above. He returned to the building on the 14th with conduct similar to the above. After writing on the wall one time; however, John had walked away from the building to pickup more chalk when he decided that the one action was enough. The two Federal Police offers were patrolling in front of the building and it seemed unnecessary to play a cat & mouse game with them and take their time away from other duties. He approached the officers and told them he would be leaving, but returning the next day. He returned to the building on the 15th with conduct similar to the above. After writing on the wall one time, John had his chalk taken away. He then returned to the front of the building to quietly petition for the next half hour. He also went back on Monday, the 18th. There had been a change in staff schedules and at their request — John kept things simple and just stood in front of the building. That completed the planned sequence. 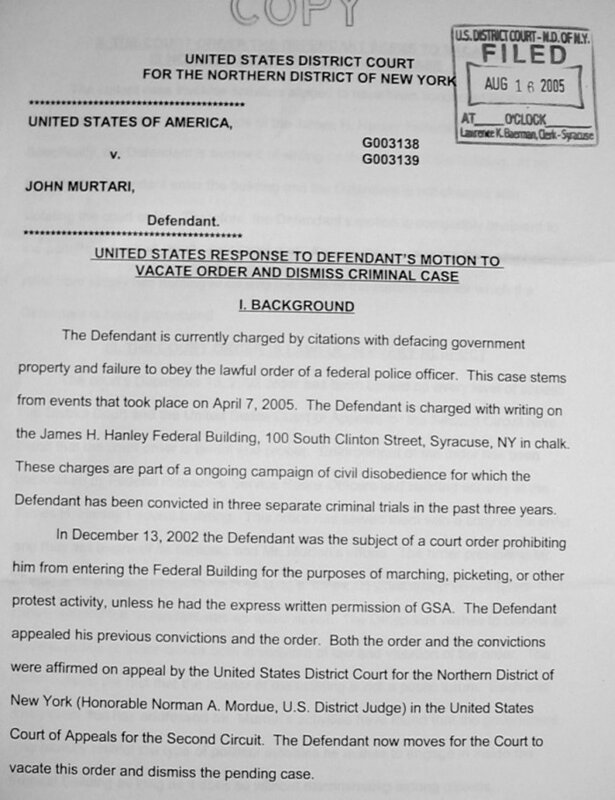 4/7/05 – John Murtari was arrested and taken into custody today when he returned to the Hanley Federal Building in Syracuse, New York. John attempted to enter the building and was denied entrance by a Federal Police officer. John then went to a nearby wall and started to write “Dom I Love You – Senator Clinton Help Us!” on the outside wall of the building using chalk. He was told not to write anything and he only finished the first few words before being arrested. He was charged with “disobeying an officer” and “vandalizing gov’t property/graffiti”. (Click here for images of tickets). He was then released. At present John plans on returning to the building Wednesday, April 13th. Your presence is welcome! Today’s action was part of an ongoing effort to convince Senator Hillary Rhodam Clinton (D-NY) of the importance to many parents of Family Law reform. 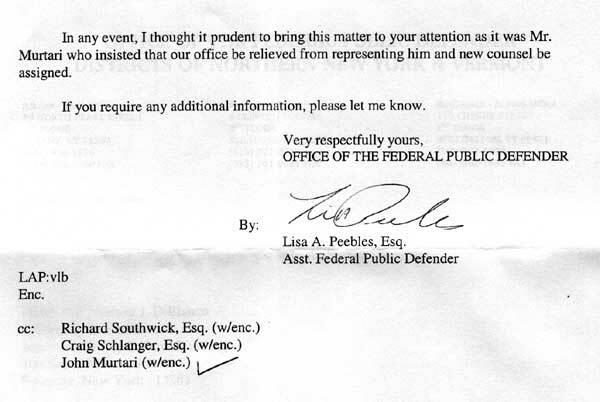 4/7/05 – After a delay, John plans on returning to the Federal Building again at 2 pm. He will first try to enter the building carrying our petition for the Senator’s help (see below, he has been blocked from entering in the past). If not allowed entry he plans on writing “Dom I Love You – Sen. Clinton Help Us” on the outside wall. Check here for updates. Your participation and presence is welcome! John also got a couple of letters from the US Attorney’s office. One letter told him a lien had been placed against his home due to an overdue $500 fine previously assessed. The other letter was in response to John’s letter of the 5th (below), it asked him to complete a financial disclosure form (which John did complete and returned on 4/13). 4/5/05 – The day prior someone who identified themselves as being from the US Attorney’s office called John’s workplace and started asking questions about him. Staff did not answer, but John did respond by sending a letter to the US Attorney’s office asking for clarification and also his willingness to give them information. (click here for entire letter). 3/11/05 – Activity will be suspended for a couple of weeks. John will be flying out west on the 20th to pickup his son for spring break, a week together! 3/10/05 – John returned to the Federal Building. After standing for a while holding our petition for help, he took out some chalk and wrote “Dom I Love You – Sen. Clinton Help Us” on four locations near the front entrance. “Take a piece of chalk and write a loving message to your kids!” No action was taken by officials. 3/8/05 – John returned to the Federal Building, it was another cold day. Syracuse had over 50 the day before — today it was about 20 and windy! After standing for a while holding our petition for help, he took out some chalk and wrote “Dom I Love You – Sen. Clinton Help Us” on three locations near the front entrance. No action was taken by officials. 3/3/05 – John returned to the Federal Building and after standing for a while holding our petition for help, took out some chalk and wrote “Dom I Love You – Sen. Clinton Help Us” on a couple of locations near the front entrance. No action was taken by officials. 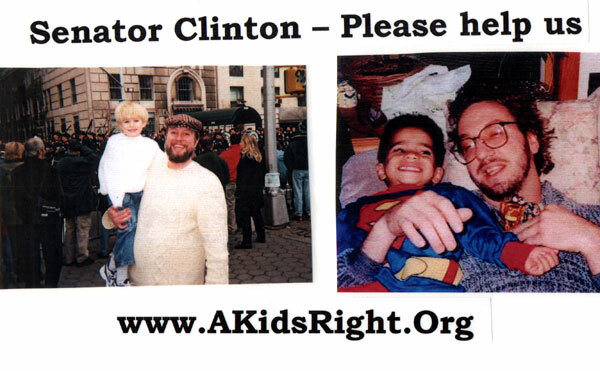 3/1/05 – John returned to the Federal Building and stood out front carrying our petition to Senator Clinton. It was a snowy day in Syracuse and the ground was very wet. 2/14/05 (Valentine’s Day) – John returned to the Federal Building and after standing for a while holding our petition for help, took out some chalk and wrote “Dom I Love You – Sen. Clinton Help Us” on the ground near the front entrance. No action was taken by officials. 1/25/05 – Click here for Video of TV News Coverage Cathy Hughes & John Murtari stood in front of the Federal Building and then used children’s chalk to write on the ground. Although John had been arrested last Thursday for doing this, no arrests occurred today! We also had News coverage from a local NBC afffiliate, WSTM – 3. They aired the story on their evening news mentioning that we were parents asking Senator Clinton to get involved with national reform and passage of a Family Rights Act. They showed us standing in front of the building with pictures of our children and also writing on the ground (our News Release). 1/24/05 – A Federal court appearance scheduled for 2PM. Asst. 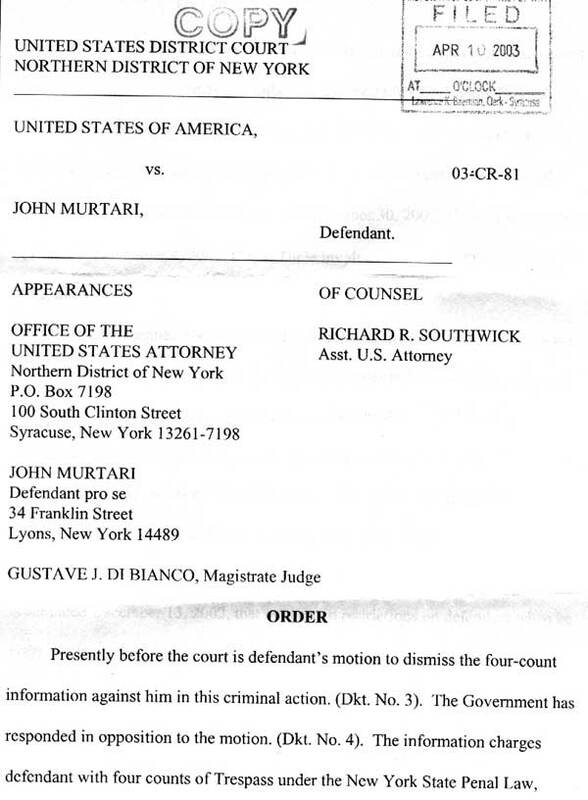 US Attorney Richard Southwick made a motion for dismissal of the pending charges against John Murtari which was granted by US Magistrate Judge Lowe. Last Thursday the US Attorney’s office was asking for a speedy trial on the matter. Mr. Southwick explained that the government had decided not to pursue the matter since the ‘damage’ was minor and cleaned up quickly. It would have been a large expense to pursue a Court case with only limited jail time or the ability to recover monetary damages. He did make it clear that the government still held they would have prevailed in Court if this had gone to trial. He was also unclear on what the government’s response would be to future events, although they reserved the right to prosecute. We can only guess at motivation and I think your calls and contacts to Senator Clinton are having an impact. There does appear to be some coordination between the Senator’s staff and the US Attorneys office. Federal Building Plaza or a “Field of Dreams” — if you build it, they will come? In past years I have spent a lot of time at the Syracuse Federal Building. At times that old Kevin Costner film has come to mind — if you build the baseball field (in the middle of your corn field while your family thinks your nuts) — they will come. The possibility of reconciliation and redemption during the journey, but always a risk. It sure does work in the movies — what about real life? PLEASE, before I go on. I don’t have any illusions of grandeur! No one else may every notice what “I” do at the building, but if “We” do it? Maybe thinking about the “Field of Dreams” will help us think about our struggle (sorry, if you don’t know the plot – rent the movie!). Tuesday at 2 pm I’ll have another piece of chalk in hand and be crouched in the cold outside the Federal Building. Pressing a simple message onto the ground, “Senator Clinton – Please help us!” I’ll be adding another line to that “Dom – I Love You”. A little after two I may be hearing the click of handcuffs on my wrists. If you build it they will come? Do they share the dream? Do they believe? Imagine what it would mean to have another mother and father with me, writing with chalk: sending a message to the Senator, telling your child how much you love them? Parents willing to hear the click of handcuffs to show how much they believe in their GREAT right. WOW — is that powerful. What type of media attention would that bring? Could Senator Clinton say no to meeting with us? What would you BUILD to make them come? I don’t know what you see as an obstacle to reform: the lawyers, judges, social workers, selfish politicans, or money? What would you be willing to write on the Plaza and risk the click of handcuffs? I HATE my former spouse! We need people who would pick the last one. In fact, I believe ONLY people who would pick the last one would even take the risk. For the others, it’s not all about reform — a big part is also revenge. Our Field of Dreams Many of us know parents who have given up (and maybe we see them in a mirror sometimes). There are parents who have hurt others and hurt themselves. They lost their children, and with them their dream. They think it is gone, never to come back…. How many orders have YOU experienced in the past that sought to limit how much you held your child, talked to your child, or even wrote your child? How many orders (and threats of jail), to stop you from loving your child? “Dom – I LOVE YOU!” How about you? Be there! He was taken into custody, arraigned by US Magistrate Judge George Lowe, and released. 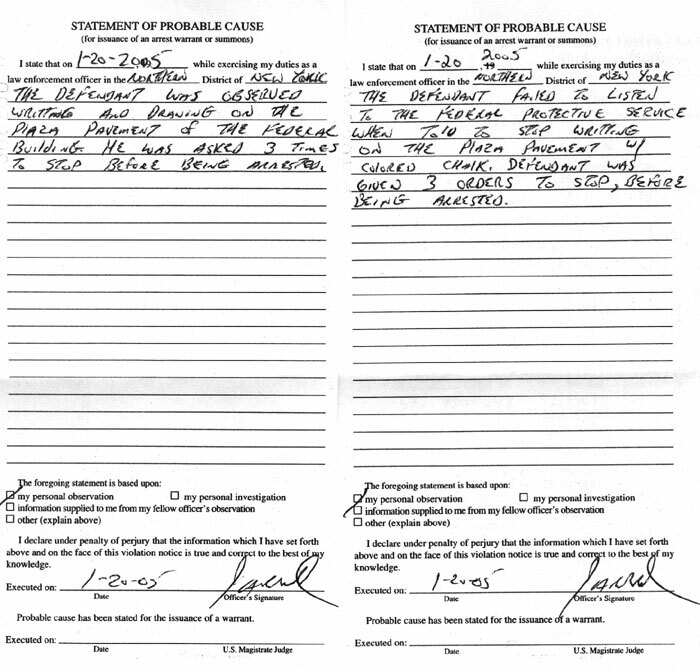 He was given two tickets for damaging government property with graffiti and disobeying an order to stop (front image / back image). For updates we encourage you to sign up for our mailing list (click here). 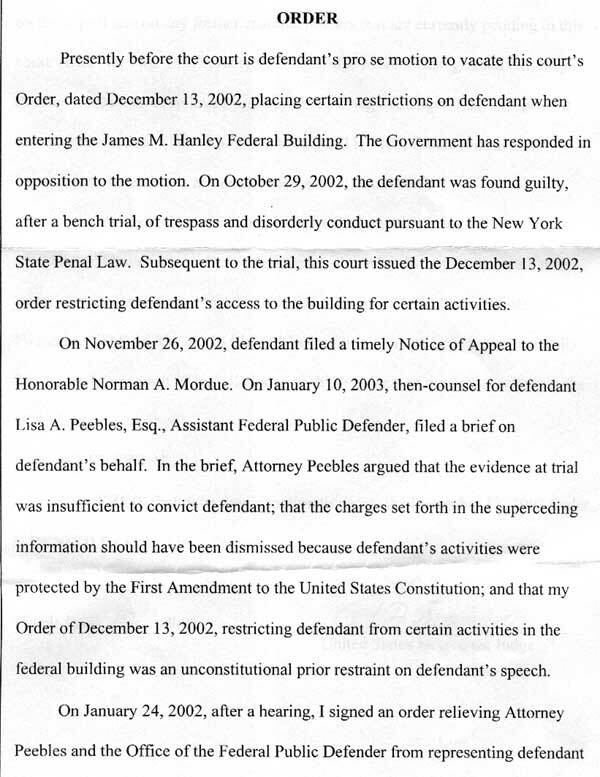 1/18/05 – John returned to the Federal Building, entered it briefly and then was pushed outside again. Security officers stayed on the inside and would not let him reenter. It has become clear that a new approach is necessary to end this standoff. I went into the building, was met by Federal Police, and pushed out of the building. I tried to get back in, but they would either block the doors or push me out if I did get in. It was a cold day in the Northeast, I think the temperature was about 5 degrees — I was outside, they were inside. I tried for about 45 minutes and then told them I was leaving and would be back on Thursday. What does that say? 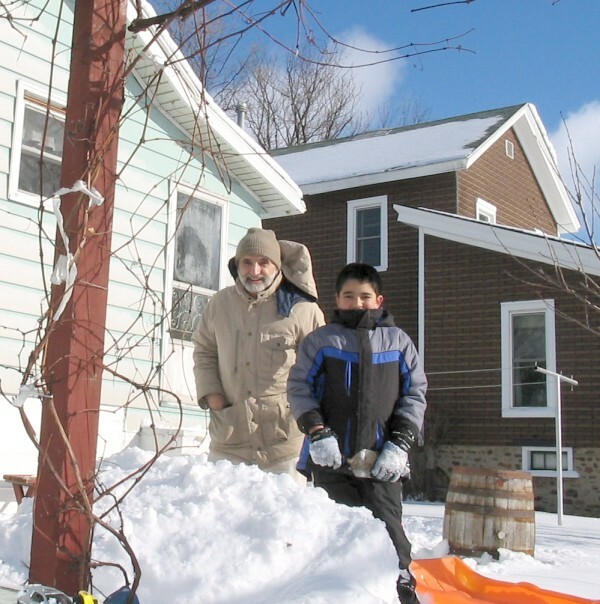 1/9/05 – Your help and presence is welcome on the 18th (excerpt from recent list message follows). 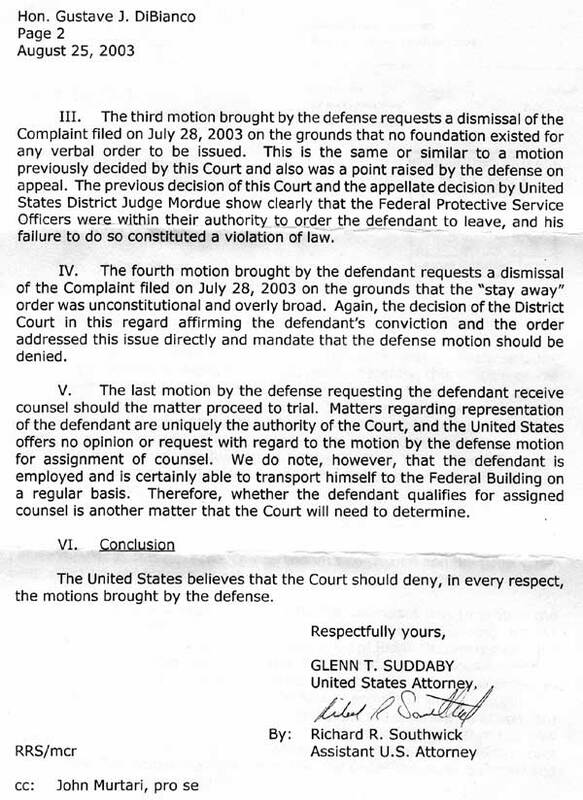 John also wrote US Attorney Glenn Suddaby regarding blocking tactics used by police. Next Tuesday, Jan 18th (the day after Martin Luther King Day), I’ll return to the Syracuse Federal Building to continue our efforts for reform. Many of you have been on the list for a while and this is nothing new. 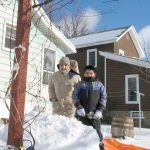 For those of you who are new, I’d encourage you to check the BLOG at the web site, http://www.AKidsRight.Org/actionc_syr. Are any of you getting a little bored of all this? I’ve been arrested 50 times and spent 147 nights in jail — has anything changed? Isn’t it time to give it a rest, try something new? HELLO — this approach isn’t working! … I had a great Christmas with my 11 year old son, Domenic. Twelve days together and we were going all the time! Trying to catch up on all the things we wanted to do — it was almost funny. Then the clock ran out and it was done. I still remember all his tears. What a crazy system we have, what a disgrace, what an indignity to any family! Our peaceful efforts have now resulted in a total of 50 arrests and 147 nights in jail as of 1/1/05 (34 charges dismissed). My mom, Domenic, and I were very blessed to have a nice Christmas together! I have include a few snap shots below (click on the image for a larger version). We had a great snow on the Monday after Christmas. Did some sledding and built a snow pile for games. 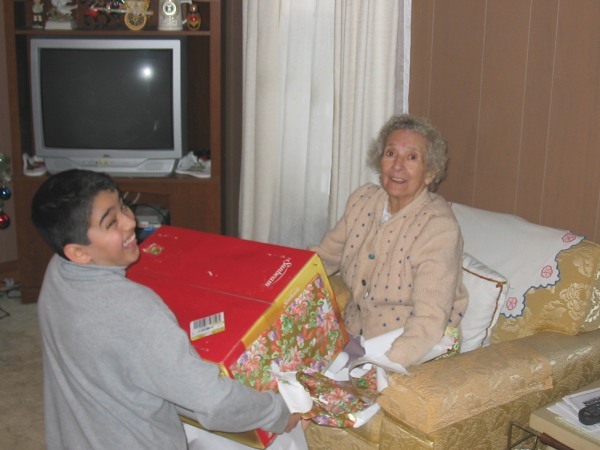 Dom helps Grandma get her present open — a new microwave! 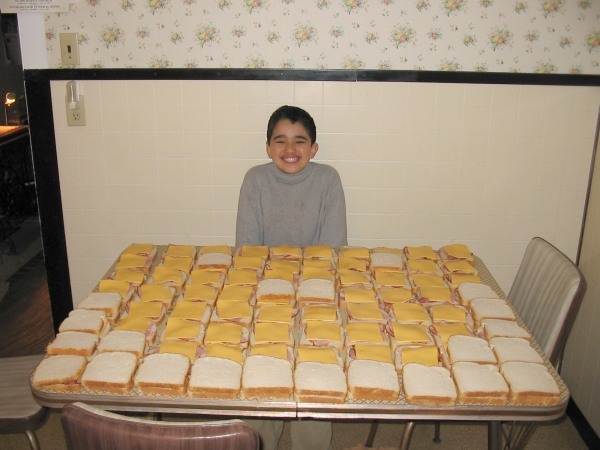 Eighty Ham & Cheese sandwiches we made for the ‘Oxford Inn’ homeless shelter. Dom & Dad! 11/5/04 – John is released and will be traveling to see his son in November and they plan on having Christmas vacation together. In January, the effort will resume, you support and participation is welcome! Follow the links above for more details, or email John at jmurtari@AKidsRight.Org , please review the web information to get a complete history of what has happened in the past. You are also welcome to call John at his office, 315-635-1968,x-211 (please leave a message and phone number). 11/1/04 – Due to bad prison conditions at the Cayuga County Jail, John helped prisoners submit a complaint to Federal and Local officials. John wrote the Editor of the local Auburn paper, and an article was published on October 20th. 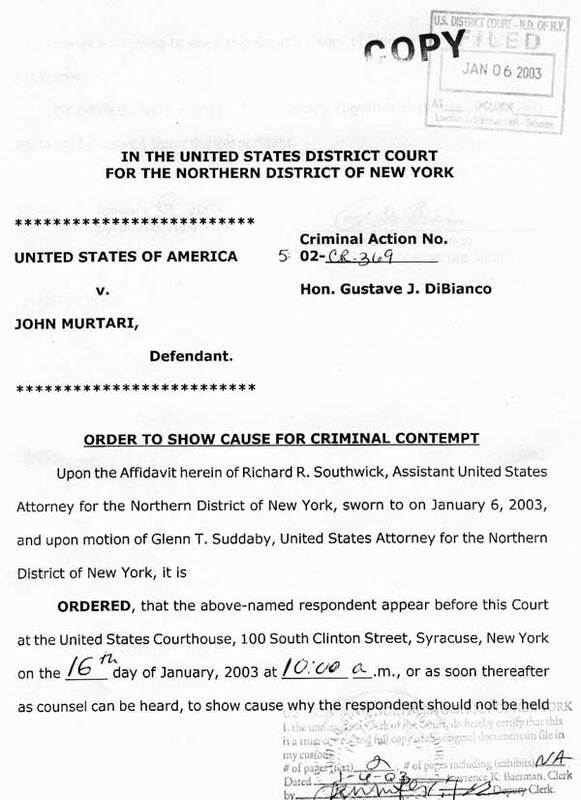 9/24/04 – Federal Magistrate Gustav J. DiBianco sentenced John Murtari to serve 44 days in jail after being tried ‘in absentia’ for 4 counts of trespass at the Syracuse Federal Building. A $500 fine was also imposed. Read the news release here. He is being held at the Cayuga County Jail. 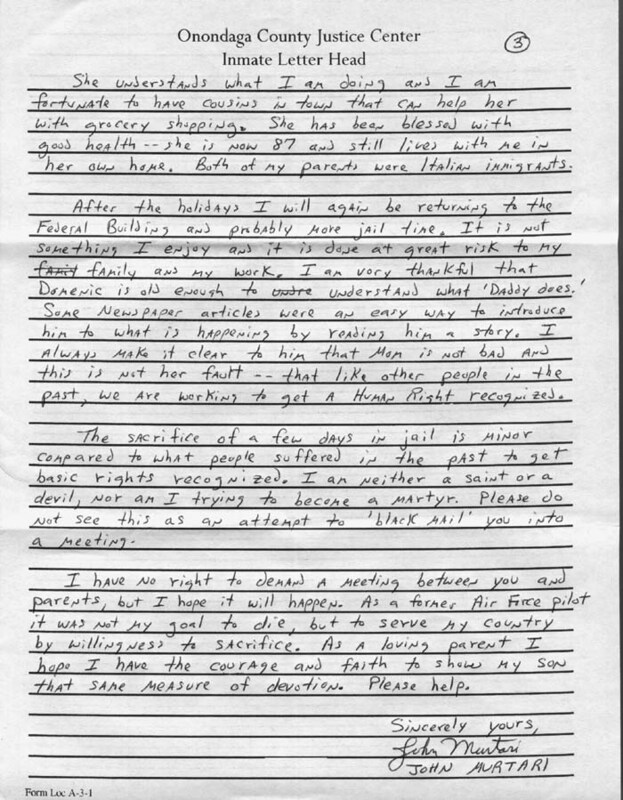 You are welcome to write to John in jail at the following address: John Murtari, P.O. Box 518, Auburn, NY 13021. Please also send a fax or make a phone call to the Senator’s offices both in Washington and Syracuse. They are paying attention to what is going on here. 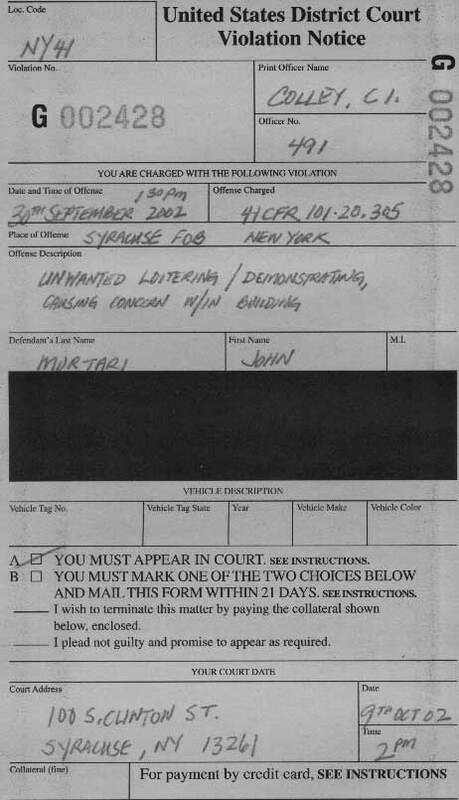 9/21/04 – John has a trial scheduled in front of Federal Magistrate DiBianco starting at 10 AM. John arrived at the building at about 9:30 AM and remained outside. There were two people, Diane Burns and Tony Sprout who had driven all the way from Ohio to be present and witness events (John was very thankful for their presence). They also paid a visit to Senator Clinton’s office and left a message with the secretary — no one was available to talk to them. Earlier this year I had tried to streamline the amount of legal processing for my arrests. But events in September showed me that authorities (Senator Clinton’s staff and the US Attorney’s office) did NOT want arrests to occur; however, they also did not want me to be allowed to proceed. This resulted in the use of physical force to prevent my access to the building and dedicating two members of security staff to block my access to the building. I was quite surprised by this. In a trial I had last November, Federal Magistrate DiBianco had found me NOT guilty on two arrests which occurred in the lobby of the building. Security staff had arrested me based on my ‘intent’ to go to the 14th floor of the building and walk outside the offices of Senator Clinton. Before an appearance a few weeks ago I had written both the Magistrate and the US Attorney’s office regarding this conduct – there was no response. Even during the Court appearance the Judge did not seem concerned and suggested I might file a ‘civil suit’ to address my concerns. I have many times drawn analogies to the Black Civil Rights movement and I could recall incidents in which police would not arrest a Black person attempting to sit in the front of the bus – they would just throw them off and let the bus go on. 9/13/04 – In another attempt at resolution John writes Senator Clinton and the US Attorneys office. 9/2/04 – John returned to the building at 2pm. He entered the foyer area but was again pushed out by Federal Police. At this point a back and forth effort was made between different doors and two members of security staff were assigned to monitor. John left at 4pm and does not plan on returning for at least a week while he makes another attempt for resolution with the US Attorneys Office and Senator Clinton. (please check here for details). 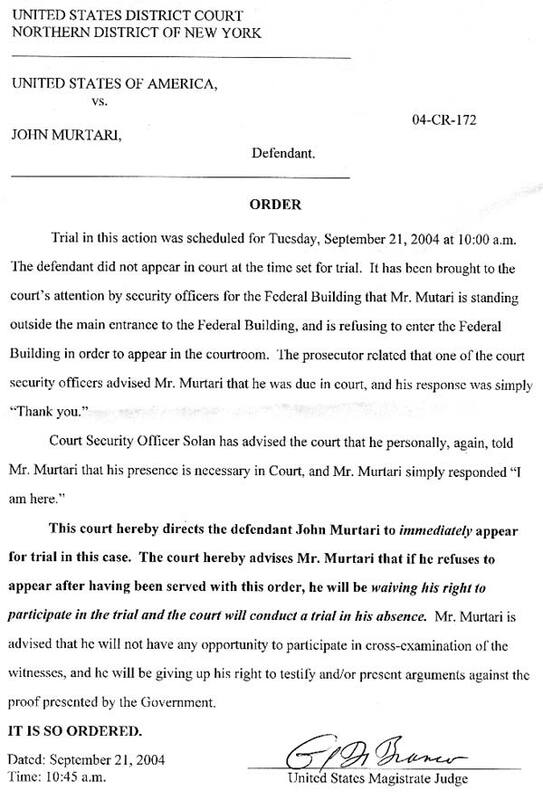 8/25/04 – Murtari again returned to the building. He was again blocked, but refused to move away from the immediate door area. In a bit of a surprise Building officials locked the revolving door where John was located and posted an officer between him and the only other entry door to the building. John remained there for two hours from 2-4pm. He plans on returning again tomorrow (Thursday) and Monday/Tuesday (Aug 30,31) at the same time. You are welcome to come and talk with John outside the building. Email him at jmurtari@aAKidsRight.org, or call at 877-635-1968,x-211. 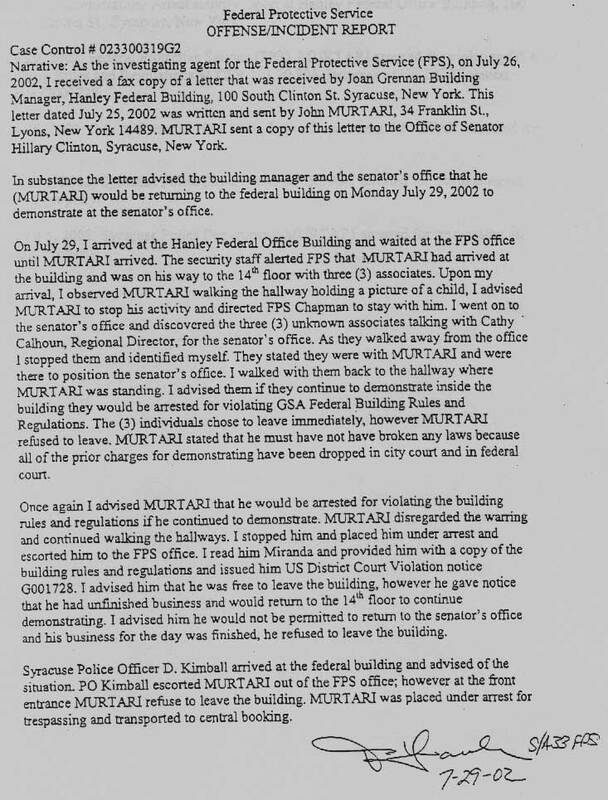 8/19/04 – Murtari returned to the Federal Building for the third time on Thursday to resume a peaceful effort to petition Senator Hillary Rodham Clinton to meet with parents regarding reform. Building security had blocked his access to the building by not allowing him through the doors. Today John returned to the building with some other errands which included visiting the office of the Federal Court Clerk. He was allowed into the building after a ‘scene’ at the front door, but was then forced out. He plans on returning to the outside of the Building on Monday and Tuesday morning and making an effort to enter on Wednesday (Aug 23-25). Your support is welcome. In addition to your letters, John sent a letter to the US Magistrate Judge and a letter to Senator Clinton for help. 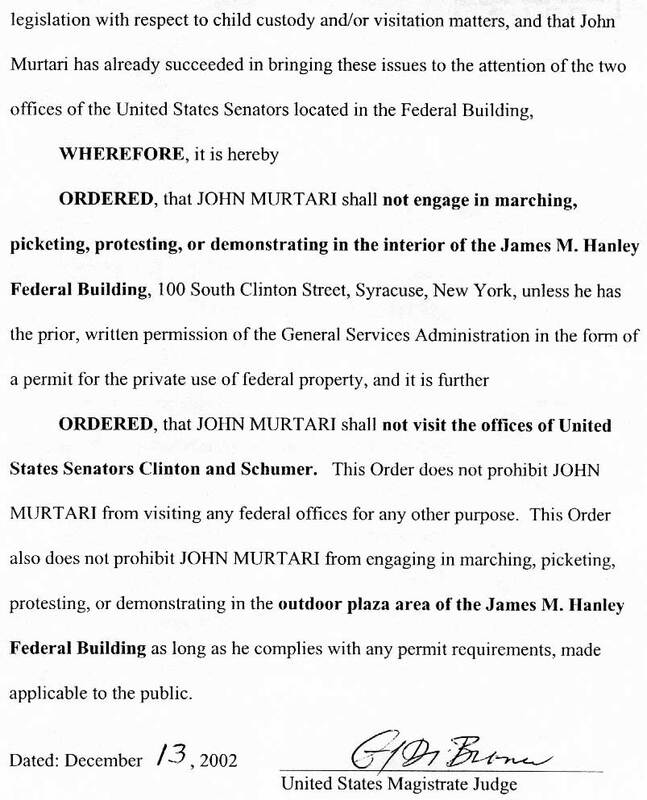 8/17/04 – John Murtari returned to the Syracuse Federal Building to resume his peaceful petition effort outside the offices of Senator Hillary Clinton (D-NY). When he arrived at the Federal Building, he was told by Federal Police officers that he would not be arrested because they were going to deny him access to the building. John remained at the front door of the building approximately two hours without getting access. He plans on returning each day and welcomes any thoughts you may have on how to proceed as the situation continues. What happened today was a bit of a surprise. It is very hard to tell what the motivation was for the change, but I’d like to think the efforts of those of you who contacted the Senator’s office (contact info above) may have had an impact. Unless they let me in, I’ll be returning to the building and standing near the door, holding our petition(above). 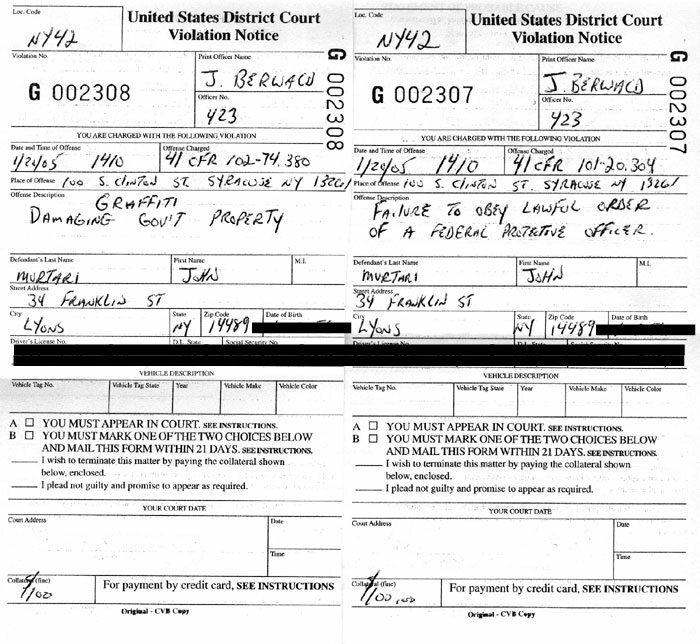 8/10/04 – It looks like there will be no scheduled Court appearances. John will be returning to the Syracuse Federal Building at app. 2 pm on Tuesday the 17th and returning to the public hallway on the 14th floor of the Federal Building (outside the offices of Senator Clinton). You are welcome to come to watch and to also demonstrate your concern for reform by visiting the Senator’s local office. 7/25/04 – A series of arrests occurred earlier on Feb 12th, and April 1st, 5th, and 7th (described below). John expects a decision from Federal Magistrate DiBianco in the next few weeks and the start of a jail sentence. It is difficult to predict schedule and John agreed to suspend his activity until mid-August for an opportunity to spend a summer vacation with his son. If there are delays in legal processing, John will return to continue our efforts on August 17th – your support and participation is welcome! Check here for updates during the next few weeks. A copy of a letter John sent to the Federal Magistrate regarding the stipulation. 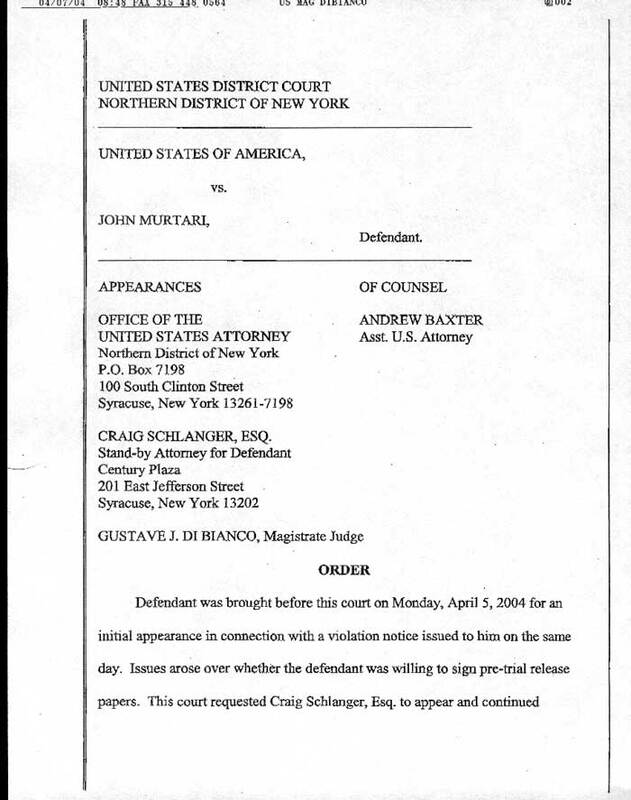 4/15/04 – John appears before Federal Magistrate DiBianco. He had written a letter earlier to the Judge explaining this was the last planned activity before August (he wanted to be able to spend summer vacation together wish his son). A stipulation was also signed agreeing that the past four arrests will be decided based on the earlier trial transcript of November 7, 2003. Excerpt from the letter -> “The tension of the recent weeks has caused me to do some soul searching. I hope all of us can try to find another path to resolution. I am not a criminal, but I find myself in the criminal justice system? 4/7/04 – A letter is faxed to the local and Washington offices of Senator Clinton asking for help. John returns to the Federal Building at 2 pm and is again arrested by Federal Police. In a bit of a change, he is arraigned by Magistrate Judge Lowe who is not familiar with the proceedings. He is released and warned not to repeat the activity. John tells the magistrate there are no more events planned. An interim appearance in scheduled with Judge DiBianco for 2pm on April 15th (your attendance is welcome). In a rather bizarre twist John is told a Secret Service agent wants to interview him. The agent had received a directive that day from Washington to conduct an interview (most likely in response to a letter for help which was sent to the Senator). Other than brief personal info, John refuses to answer any questions. I was very worried returning to the building today and I almost called it off. I knew that Judge DiBianco would be furious when he saw me (especially after issuing another order) and I knew I would be detained. We have talked so much about sacrifice as part of NonViolent Action, but I was really afraid I would miss the chance to see my Son at the end of April (the loss of a weekend), and potentially lose our 6 week summer vacation together starting in early June (which would have been devastating to him and me). I am still looking a jail time for these 4 events, but I hope a conflict with that vacation can be avoided. As a personal policy I commit myself to going back to the building a certain number of times before I start an effort, but I do not let authorities know what my plans are. I was relieved to find out Magistrate DiBianco was not available that day! Even though I planned on telling him this was the final event — I did not think it would matter. I think we have all experienced that in Family Court proceedings. Fortunately, in this case I do have a real presumption of innocence! This incident does underscore the importance of NonViolent Action in keeping the focus on the real issues. PLEASE READ THIS – I expect some people will use this Secret Service episode as another reason to criticize the Senator. Don’t do that, it is pointless. The real question WE PARENTS need to ask is: if this issue is so important that Senator Clinton should get personally involved — Why is only ONE parent outside her offices? If you think of all the excuses you have for not getting involved, maybe you will be more understanding of others…. PLEASE, it would be a great help if you could just make that phone call and send a personal fax (numbers at top of page) to the Senator’s offices! WE need to let them know it is an important issue. Again, don’t be rude or angry. Share the pain you went through and tell the Senator we need to look at protecting Family rights! 4/5/04 – John returned to the building and went to the 14th floor. He was again arrested and arraigned by US Magistrate Gustav J. DiBianco. John asked the Judge for a stay in the proceeding and in prosecution until the appeal process was completed. It was quickly denied. John was offered a ‘conditional release’ form but refused to sign it since a condition was no more offenses. 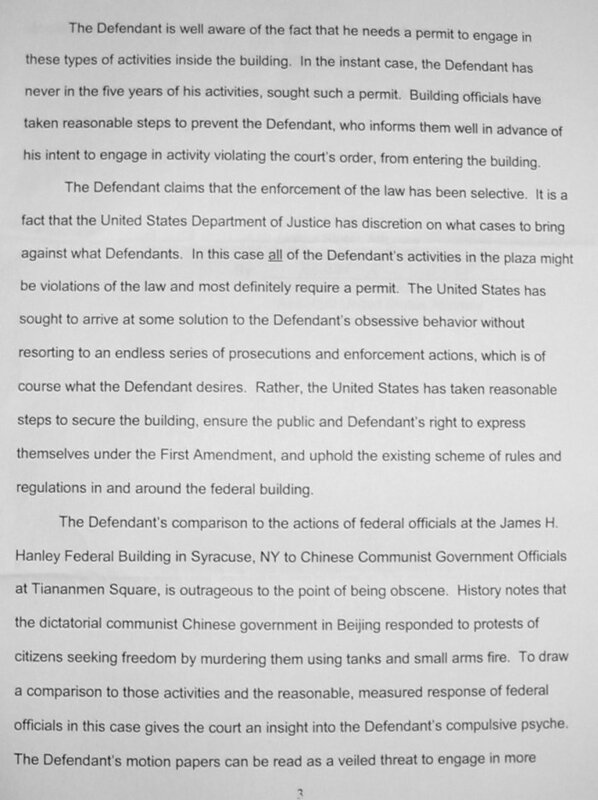 The Judge issued an order regarding his release, page 1 and page 2. 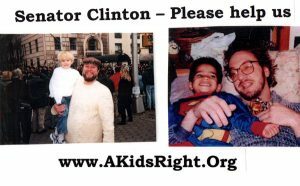 4/1/04 – John returns to the Federal Building and goes to the 14th floor to continue his peaceful petition of Senator Clinton by walking in the public hallway while caring the above petition. He is arrested by Federal Officers and arraigned and released by US Magistrate Gustav J. DiBianco. After some reflection I had decided to intensify the efforts at the building. The stipulation still was not ready and this will allow more charges to accumulate and a potentially longer jail sentence (which I had hoped to avoid). We have had several messages on the theme of sacrifice on the mailing list (check here for a sample). I had hoped more people would be involved in this by now, but the effort needs to move forward. 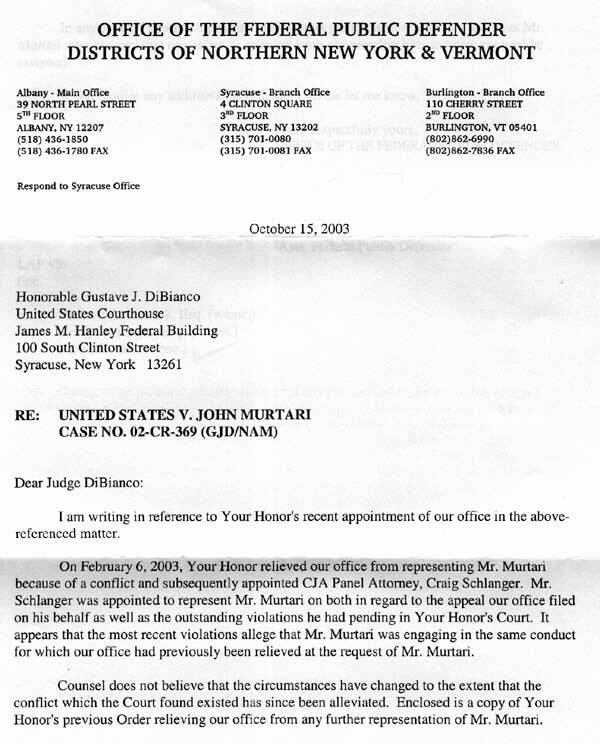 3/24/04 – A letter is received from US Magistrate DiBianco asking both sides to reword the stipulation for clarity. John agrees and waits for the new version. 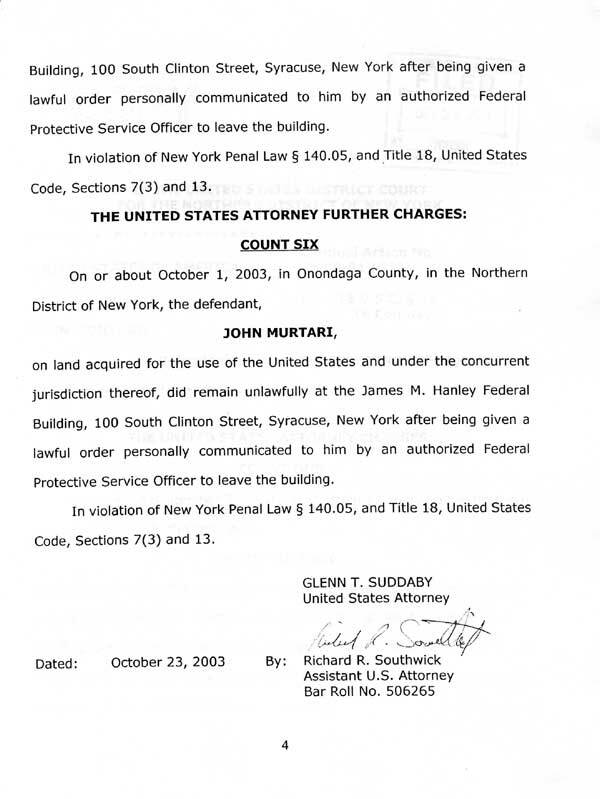 2/12/04 – John Murtari was again taken into custody by Federal Police outside the offices of Senator Clinton on the 14th floor of the Syracuse Federal Building. As usual, he was carrying a simple petition made up of pictures of moms and dads and children who have been separated. He was arraigned and released by US Magistrate Judge DiBianco. Both sides plan on “stipulating” to the facts and allowing the Judge to make a quick decision based on almost identical facts from a previous trial (a decision of guilty and jail time is expected). See letter below for more details. 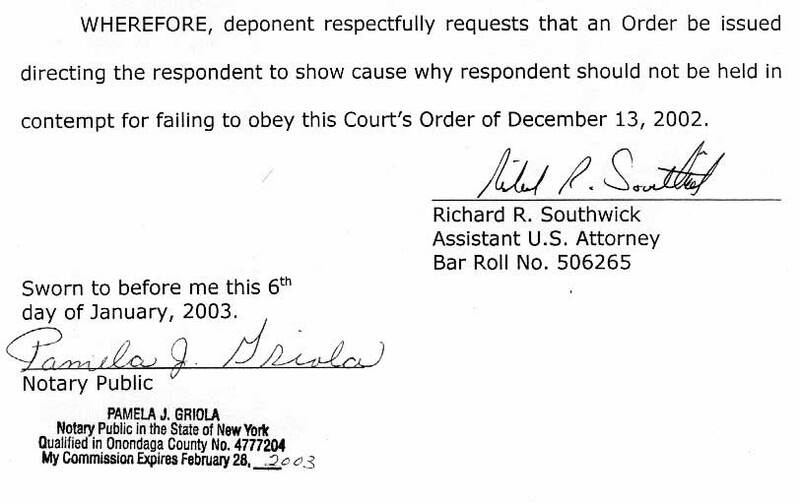 1/23/04 – John writes to the US Magistrate regarding the upcoming action and to hopefully smooth the legal process. 1/09/04 – Our plan is to resume NonViolent Action on February 12th. Some meetings are planned for later this month and info will be posted to the site and via our mailing list in the next few weeks! 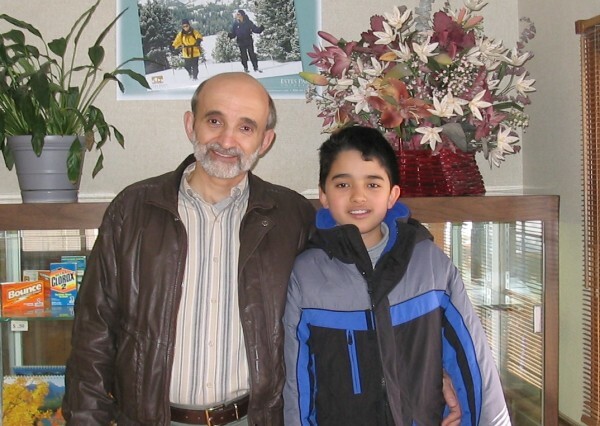 12/12/03 – John was released from Jail in time to travel and pick up his son for their Christmas Holiday together. He was thankful to all who wrote both to him and Senator Clinton! 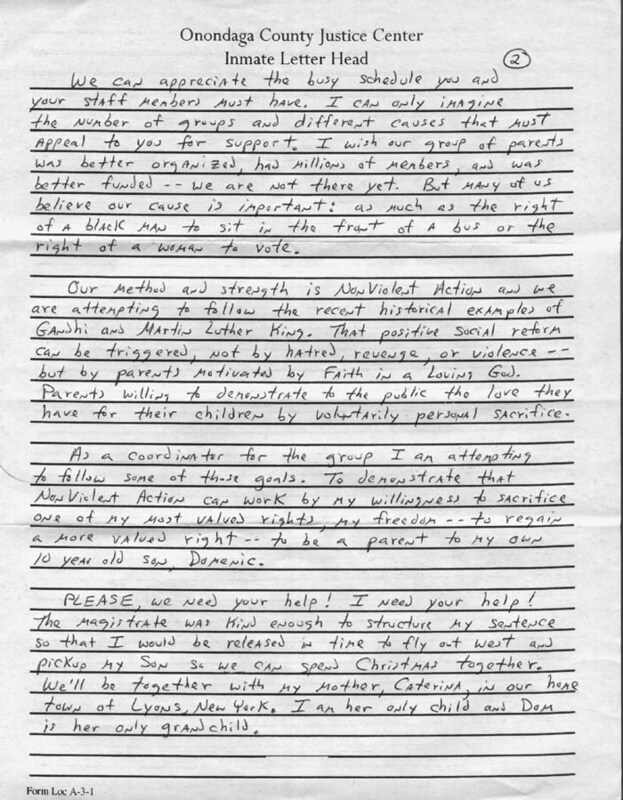 11/29/03 – From jail, John wrote a letter to Senator Clinton asking for a meeting between her and parents. Read the letter here. See handwritten copy (Page1, Page2, Page3). 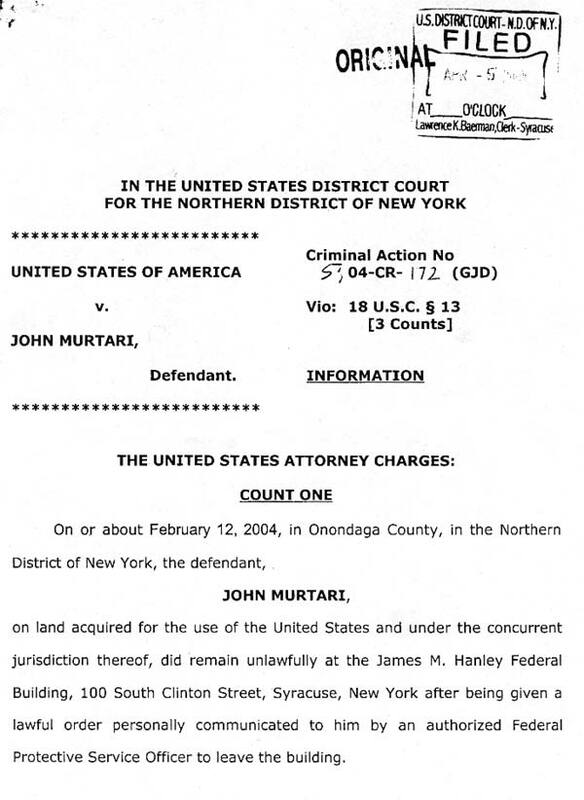 11/7/03 – John Murtari went on trial at 10 am at the US Court House for the Northern District of New York, Hanley Federal Building, Syracuse. He had appointed counsel. The US Attorneys office had filed the following complaint (page 1, page 2, page 3, page 4). Other trial notes are here. The trial ended at approximately 3pm and Magistrate Judge DiBianco asked both attorneys to file additional notes on some case law by Monday. He plans on making his findings and issuing a sentence for John on Monday at 3pm in the Court House. 10/9/03 – John returned to the Federal Building at 1330 today. Federal police asked him why he was at the building. He responded, “I’m here to petition my Member of Congress.” He was taken into custody while in the lobby of the building.. He was taken to a holding cell used by the US Marshalls in the Federal Building and appeared before Magistrate DiBianco at about 5 pm. The Magistrate said he had reviewed Federal procedures and he had no authority to detain John pending trial. After some discussion about moving up the trial date to next week, it was decided to keep it at October 23rd. John was also assigned counsel from the Federal Public Defenders office. He was then released. 10/2/03 – John plans on returning to the Federal Building on October 9th at 1:30 pm to continue our effort for reform. Your participation is welcome. When I returned to the building on the 1st, the plan was to also visit the building on the following week. During my arraignment yesterday Magistrate DiBianco was clear in his desire to get all these pending arrests processed. A trial date was set for October 23rd, starting a 10am. I’m not quite clear on the details, but it appears all the pending charges will be tried. I was also told that if I returned to the building prior to the trial date, that I would be jailed until the trial date. We have talked about NonViolent Action, but putting it into practice can be difficult. After watching all the pain my son has been through and how our rights were trampled — is jail supposed to be a deterrent? What else can be taken from me? No one is “taking my freedom” the way they “took my child”‘; I am willing to sacrifice it to show how important reform is. Jail is going to “hurt”, but is it a “bad/evil” consequence? No. I’m a parent acting not with anger or malice toward anyone, but with good intention. Peacefully demonstrating the depth of my love for my child and the depth of my belief in reform — I have Faith only good things can happen…. 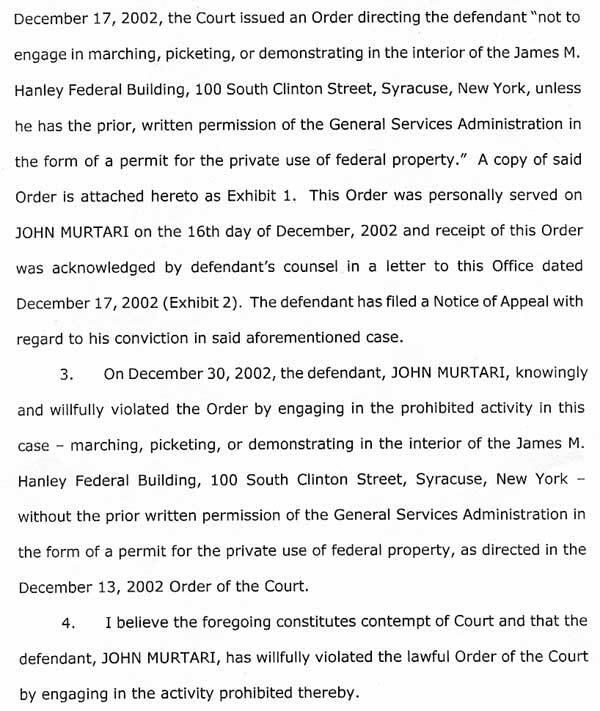 10/1/03 – John Murtari returned to the Syracuse Federal building to again peacefully petition Senator Clinton. Federal police asked him why he was at the building. He responded, “I’m here to petition my Member of Congress.” He was taken into custody while in the lobby of the building. He was arraigned by Federal Magistrate DiBianco and released. We will have more details at the site as they become available. 9/26/03 – Another letter is faxed to the Washington offices of Senator Clinton requesting a meeting between her and parents. Full contents of letter. 9/14/03 – Plans are again made to resume the effort on the 1st day of October. I regret the delay since August 4th. I work at a computer company. We have a small staff and I am one of the two senior administrators. The other administrator left suddenly for other employment (which happens), but it fell to me to help find and train a replacement. My mom (87), also had a series of appointments for medical tests to confirm/deny the results of other blood work — very, very fortunate that everything came back fine! We will be traveling to see Domenic the weekend of Sep. 19th. 9/1/03 – John found out that his conviction for “disorderly conduct” had been upheld by a local Federal Judge (the first step in the appellate process). He has asked his assigned counsel to start the appeal process to the US Court of Appeals, Second Circuit. This sounds so trite, “but I didn’t do it.” It would have been one thing to be found guilty of peacefully walking in the halls in an attempt to petition Senator Clinton for reform in violation of some building rules (but I was found not guilty of that). The problem seems to be the other people that were visiting the Senator’s office while I was out in the hall — an impression was created that we were some type of “gang” up to no good. There is no government “conspiracy” here and I have a great deal of respect for both the Judge and the prosecutor. As I have said in my letter below, they have treated me kindly. These things just seem to happen sometimes (and I think more often when there is a non-jury trial). The consequences here may be a few more weeks/months in jail — when the experience happens to you in Family Court — your relationship with your child may be destroyed for a life time. I was a little surprised by the decision and also that I had not heard anything from my assigned counsel, Mr. Schlanger, who had been assigned to complete the appeal process. I wrote him regarding the status of the appeal and got a reply a few days later. 8/4/03 – NonViolent action is scheduled to resume at app 1:30 PM. This has been delayed. There was a “problem” at John’s place of work and his presence will be required there for a while. The exact duration is not known. He does plan on being outside the building at 1:30pm, but just to talk to people who may not have seen this message. 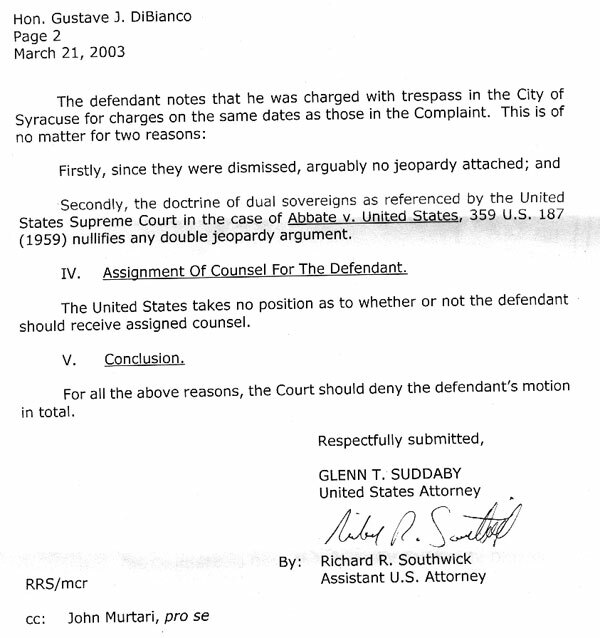 7/31/03 – In an attempt to reach a “compromise” John submits a motion (Motion & Affidavit) to the Federal Magistrate and also includes a letter which attempts to explain what is happening and why. 7/28/03 – John Murtari returned to the Syracuse Federal Building again today in a continuing effort to petition Senator Hillary Clinton regarding Family Law reform. He was joined there by Gary Taubar who visited Senator Clinton’s office to ask for help in finding his son. John was arrested by Federal Police on the 14th floor and was arraigned later in the afternoon by US Magistrate Judge DiBianco. He was then released pending trial. The effort should resume again on Monday, August 4th. Check the site for updates. 6/13/03 – Plans are to resume the effort on July 28th, your participation is welcome. Registration links at the top of this page. 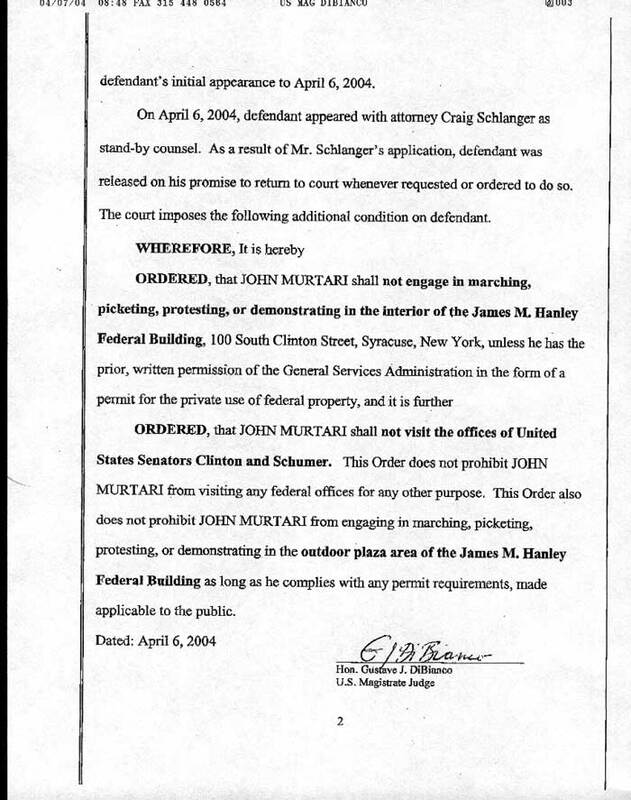 4/14/03 – The US Magistrate Judge who has been presiding over the Federal prosecution of John for his activities issues a couple of orders in response to motion’s filed below. 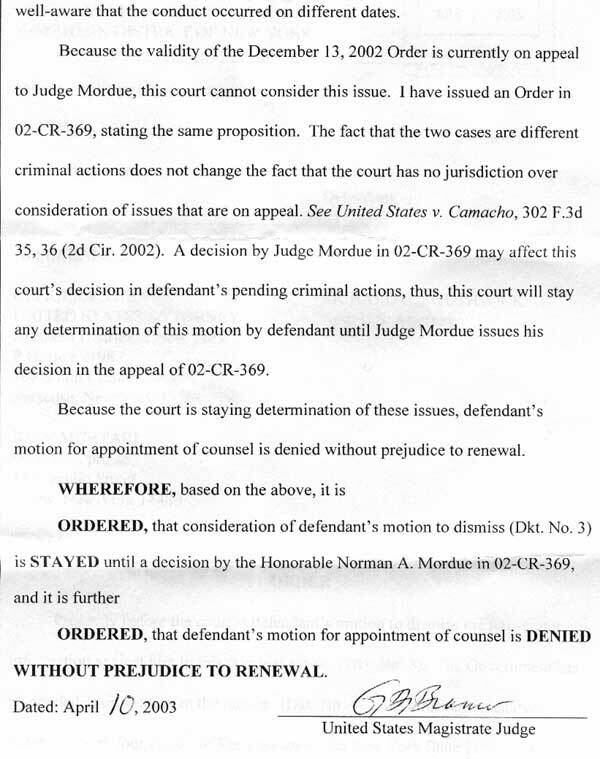 Read the decisions (Decision 1, page 1, page 2 , page 3; Decision 2, page 1, page 2, page 3) In summary he stays final decisions until US District Judge Mordue issues a decision on the pending appeal submitted by Federal Public Defender Lisa Peebles, Esq. of his earlier trial. It was a relief to here there would be no legal activity in the next few months! I also learned in early May that my mom is fine and she has responded well to medication. We are both looking forward to seeing my son Domenic in June/July for 6 weeks, and then I plan on resuming our efforts for reform. Your participation is welcome and needed! 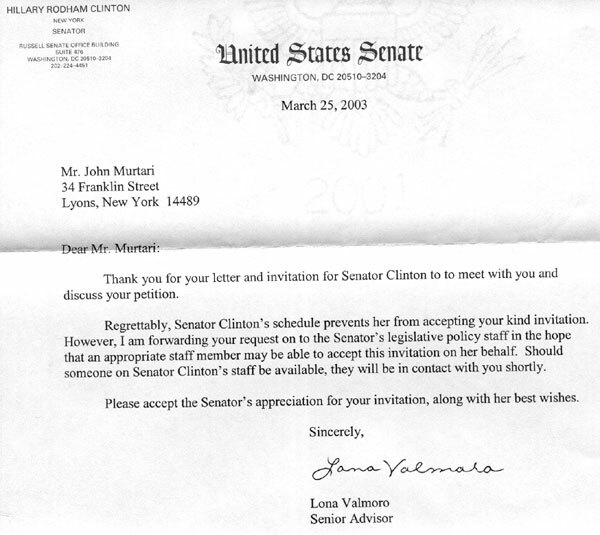 4/10/03 – A letter is received from Lona Valmero, a senior advisor to Senator Clinton. Her schedule does not permit a meeting, but one of her legislative aids may contact us for a meeting. We would be happy to talk with anyone, but our efforts will continue to get a meeting with the Senator. This is an important national issue. I have had to suspend my actions because of my mother’s illness. I’m her only child and as you can imagine taking her for lab tests, etc… is time consuming and with the language barrier, it is crucial for me to be present. I also have plane tickets to visit my son out west at the end of the month and we should have a 6 week summer vacation together starting June 6th — resuming the effort in May could put that at risk so I plan to continue in August. 4/4/03 – John’s mother (age 86) was admitted to the hospital for testing and treatment of potential blood clots in the lungs. This will be at least a 3 night stay with more treatment afterwards. At present he is not sure when he can continue the effort. If there are those of you ready to continue, please contact him (jmurtari@AKidsRight.Org). More news next week! 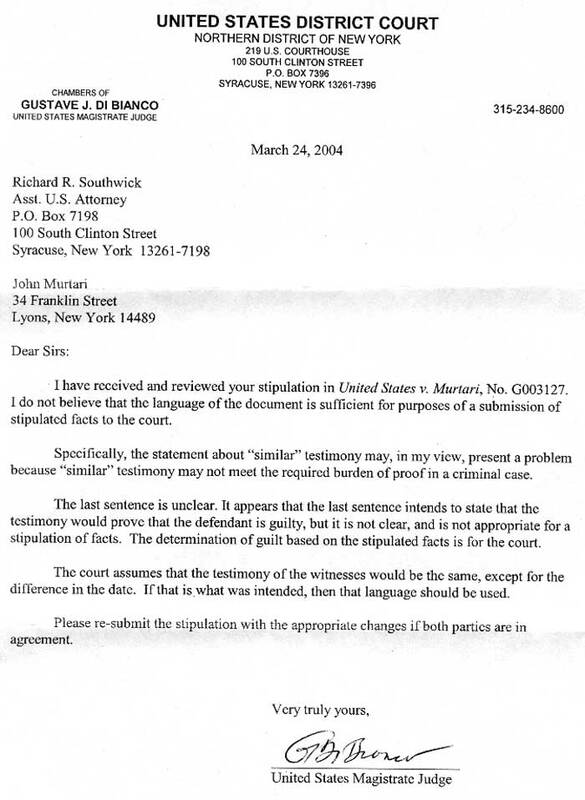 4/3/03 – In preparation for next week John sends a brief letter to Magistrate DiBianco and Mr. Southwick (the Asst. US Attorney prosecuting the case). 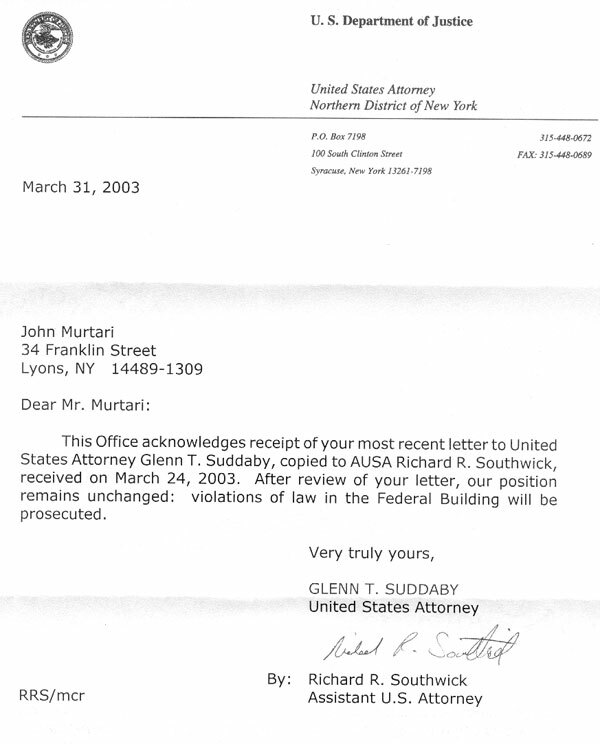 3/20/03 – John writes a letter to Mr. Glenn Suddaby, US Attorney for the Northern District of New York(copy to Senator Clintons Syracuse Office & fax to DC office) asking for him to review the case and consider a halt to prosecution pending appeals. Mr. Suddaby replies and states the governments intention to prosecute any violations of the law (letter here). 2/27/03 – John appears in Federal Court to be arraigned on the remaining charges. The US Attorneys office delivers a four count complaint (page 1, page2, page 3). On March 13 John submitted a motion to the Federal Magistrate to have the pending charges dismissed and also for the assignment of counsel. 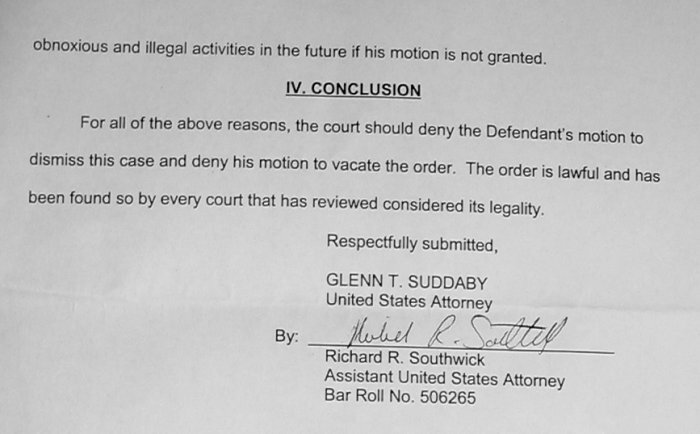 The reply from the US Attorneys office regarding John’s motion (page 1, page 2). “I asked the Judge for time to submit a motion to dismiss, and he gave me two weeks, till March 13th. The other motion is still pending, the US attorneys office still has not filed their reply. In the new 4 count complaint they are charging me with Failure to Obey a lawful order on all occasions. The incident on Sep 30th occurred before my Federal Trial. The incident on Nov 4 occurred after the trial, but before any order was issued. The incidents on Dec. 30th and Jan 6th were after the stay away order was issued.I assume I have a good reason for dismissal on the first two: there has to be a basis for them to order me around and they had none. They only told me I had to leave the building because I was in violation of building rules (which the judge found me not guilty of in the trial). 2/22/03 – John appears again in front of Syracuse City Judge Kevin Young. His attorneys motion for dismissal on the remaining charges is granted. This is approximately the 28th charge to be dismissed in City Court. 1/29/03 – A trial on one of the remaining trespass charges is scheduled in Syracuse City Court in front of Judge Kevin Young. Mr. Charles Keller, an attorney from the Hiscock Legal Aid Society, will represent John. He has represented him in the past and is very familiar with the matter. (The charge was dismissed). 1/22/03 – There was an appearance in Federal Court over John’s request to have a new attorney assigned and time to file motions prior to a Contempt hearing. The Judge removed his present attorney, but did not assign other counsel. The date for the Contempt hearing was adjourned without date and motions must be submitted by February 12th. Action on the pending charges is awaiting detailed complaints from the US Attorney’s office. 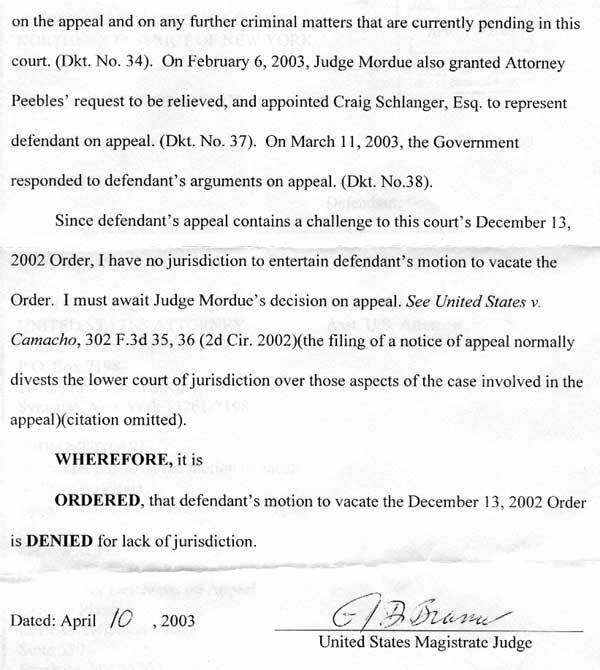 1/19/03 – A hearing on the Contempt is scheduled for Jan 28th. As always we would like to get more people involved in the effort. DRAFT of Federal Appeal (We hope you will find in an excellent summary of what went wrong in Court. The first level of appeal is to a US District Court Judge. The next level of appeal, if necessary, would be the 2nd Circuit Court of Appeals. 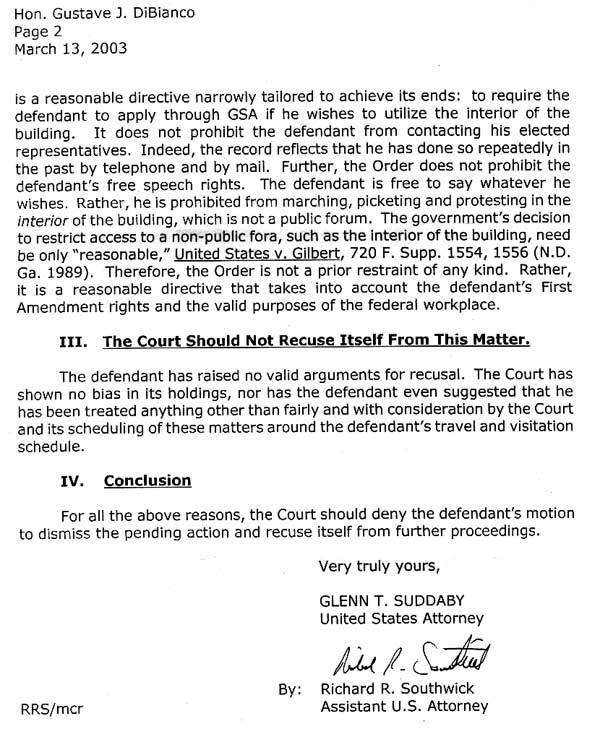 Judges order regarding “no protesting” (page 1, page 2). Request by US Attorney to have John held in contempt (page 1, page 2, page 3). 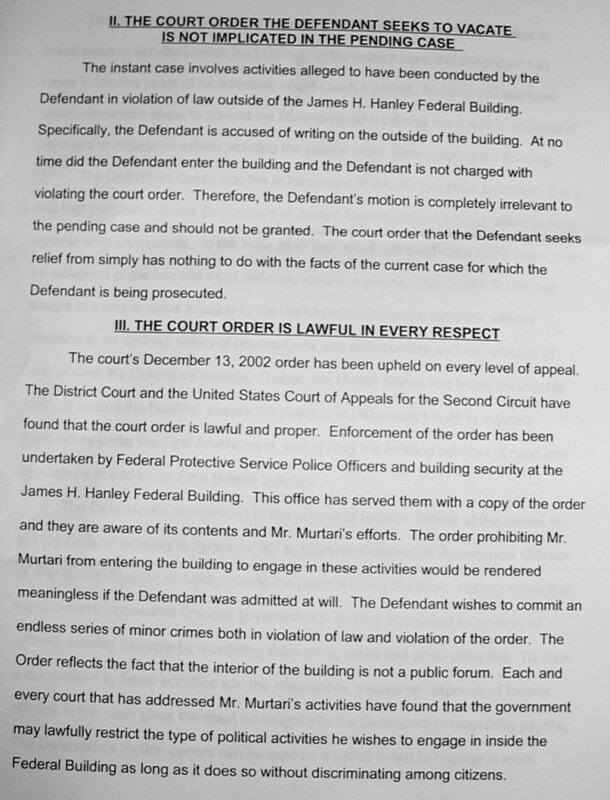 Order to Show Cause issued by Judge (page1, page 2). “This could be a rather frightening week with almost a certainty of more jail time and my big hope is that it will not affect a planned trip to see my son Domenic in mid February. Part of me is very worried, this thing is turning into a real train wreck in Federal Court with so many items pending. What I fear the most is that people will “dig in.” The order is so sweeping and broad, and also based on “non” facts, that it will almost certainly be overturned — but in the meanwhile, as law biding citizens we are expected to obey even “bad” orders until they are changed (and I assume that includes unconstitutional orders?). Really, I don’t like putting the Judge and US Attorney in the position they are in to have to “nail” someone. If our issue was tax reform, or animal rights, or global warming — I’d be more than happy to wait a few weeks/months. I would not risk jail over those issues. But this is about our children (and my child). Each moment the “system” continues is one of pain for a lot of people and it needs to stop. I must live the sense of urgency we all feel, but do it in a peaceful manner. I certainly have no doubts about what has happened in the past. Continuing the effort was the right thing to do. My perhaps “naive” hope is that the people involved will see this as a political manner, and not a criminal one. That I will be allowed to proceed with my petition efforts in the building until all appeals are exhausted. Certainly, everyone knows that I have been allowed to proceed in the past and on two prior occasions the Federal Government dismissed charges. I have at least been consistent in my actions. 1/7/03 – John was arraigned and released by City Judge Kevin Young. 1/6/03 – John returned to the Federal Building and was arrested on the 14th floor for trespass, loitering, and disorderly conduct. He was also given a Show Cause Order signed by a Federal Magistrate to appear in Federal Court on Jan. 16th for potential contempt charges. He was arrested by Syracuse City Police and should be arraigned in City Court tomorrow. This is John’s last planned NonViolent action until mid-February. He has plane tickets to visit his son out West the weekend of Feb. 13th for his birthday. John hopes the pending court appearance will not put that visit into jeopardy. 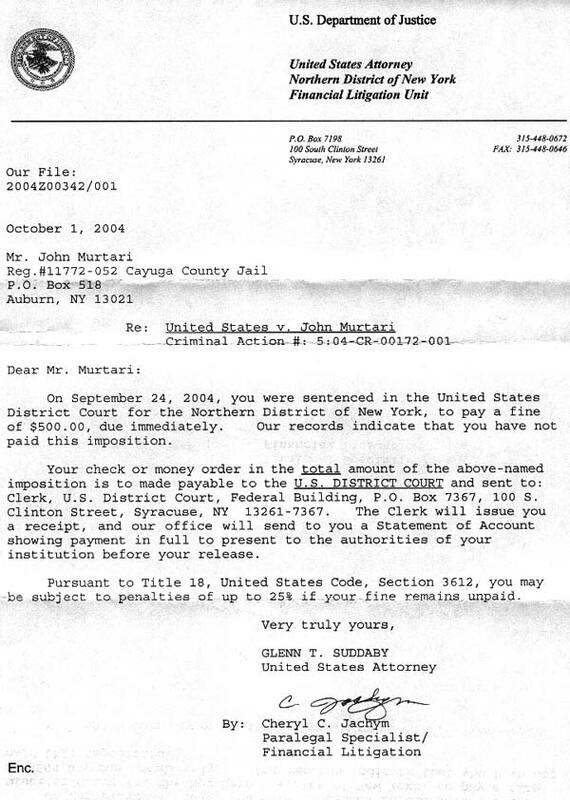 1/2/03 – John wrote to Mr. Joseph Pavone, the US Attorney for the Northern District of New York, and asked for a review of what was happening in his case (see the letter here). He also asked that the US Attorney’s office investigate potential abuses of the Civil Rights of parents and children by the Family Law system of New York. Another letter was sent to the local office of Senator Charles Schumer (see the letter here). For an unknown reason the Judge’s order had prohibited John from contacting their office? The group PR person, Mary Jo Marceau-Hawthorne, visited the office on the 30th, had a nice visit, and was able to confirm they had not asked for that and had no problems with John or the rest of the group in the past. We hope they will be able to get Senator Schumer’s name removed from the order. There has been no response at all from the office of Senator Clinton to events after repeated contact attempts (see below). John did contact the Senator’s office and talked to Eric in scheduling, he was familiar with the group. Eric said a new manager of scheduling would be in place Monday. Another copy of your letters was faxed to Eric along with our meeting request and he did receive it. We hope there will be a meeting soon. John plans on returning to the building on January 6th, at app. 1 PM to continue our efforts. Participation by concerned parents is welcome (and needed). 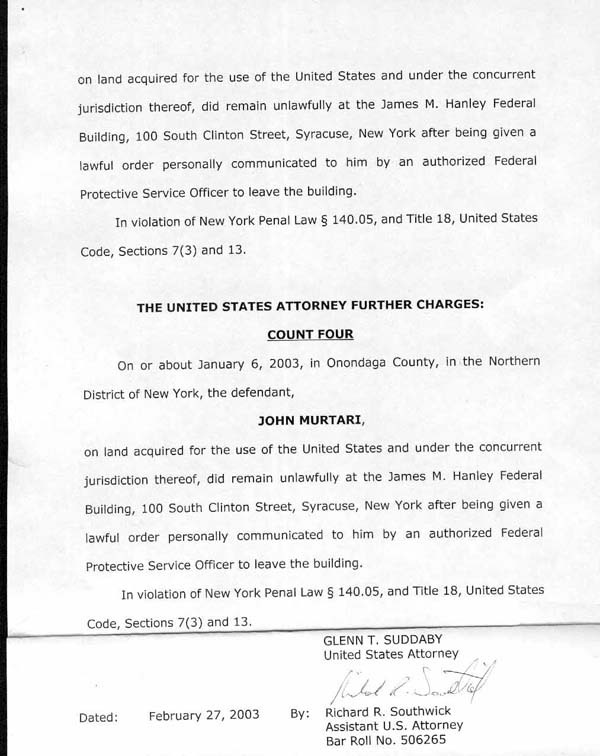 12/30/02 – John returned to the Syracuse Federal Building again and was arrested by Federal police on the 14th floor. He was first charged with loitering and then when he wanted to return to the 14th floor he was given tickets for trespass and disorderly conduct (while sitting in the office of the Federal Police). He was then taken into custody by Syracuse City Police. He should be arraigned tomorrow in Syracuse City Court. There may be additional Federal charges filed for violating a Judge’s order on Thursday. He was arraigned the next day by City Judge Higgins and released. 12/28/02 – Just a personal note, Domenic was here for a week and we had a great time. Here is a picture of him (age 9), me, and my mother (you can click for a larger version). It was a very good year, here is a copy of our Christmas Newsletter. 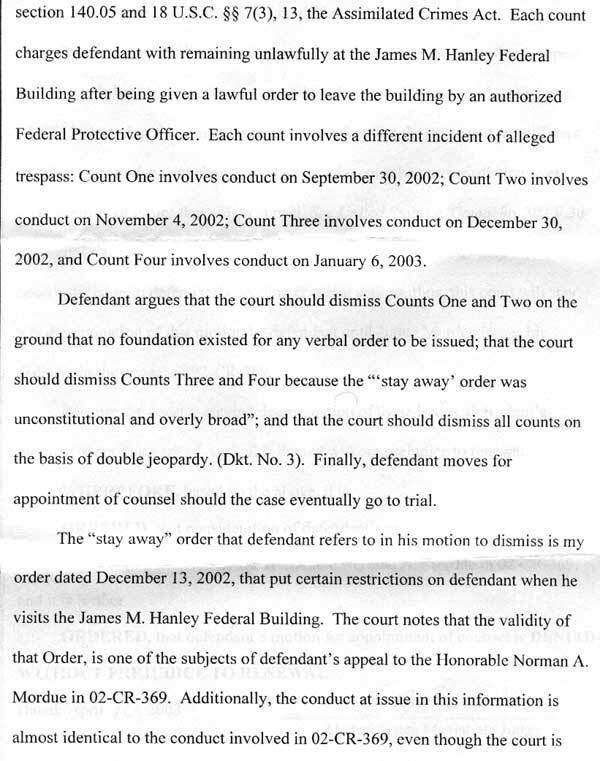 12/16/02 – John gets a copy of a stay away order from the Judge from his Federal Trial. . You can read page 1 and page 2. You can read some of John’s earlier comments on the trial results here. He hopes his attorney will be able to do “something” before December 30th, but there may not be time. His plans are still the sam. 12/12/02 – A package is sent to Senator Clinton’s local and Washington offices (via FedEx) asking for a meeting with parents. The package contains letters written by other parents and copies of local news articles. 11/22/02 – John was sentenced today to 10 days in jail by US Magistrate Judge DiBianco in the Syracuse Courthouse for the Northern District of New York. On his release John plans on resuming the effort on December 30th. 11/4/02 – John returned to the Federal Building at 1pm and was arrested and spent another night in jail. He was arraigned by City Judge McKinney the next day and released. Thursday he appears in front of City Judge Young for motions and to set a trial date for state charges against him. Trial date was set for January 29th at 9AM on the trespass charge originating from July 29th, all others had been dismissed. 10/03/02 – A day earlier John learns that US Magistrate Judge DiBianco has assigned him counsel from the Federal Public Defenders office in Syracuse. He meets with his assigned counsel, Attorney Lisa Peebles, and also a research assistant, Attorney Melissa Tuohey. They seem experienced, capable, and eager to provide an active defense. It was quite a relief for John! His trial will not start on October 9th, but their will be motions made. 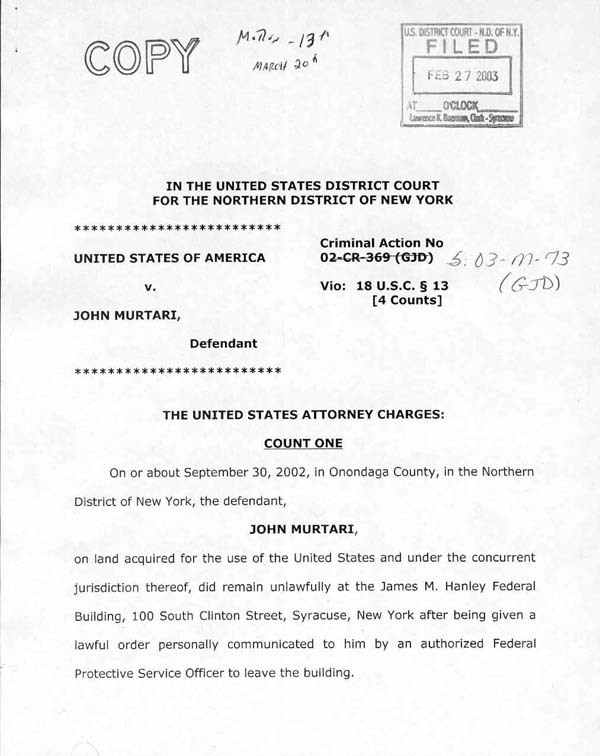 10/01/02 – John is arraigned by City Judge Rosenthal and released. No activity is planned in the next weeks so that John can prepare for trial in US District Court on October 9th. 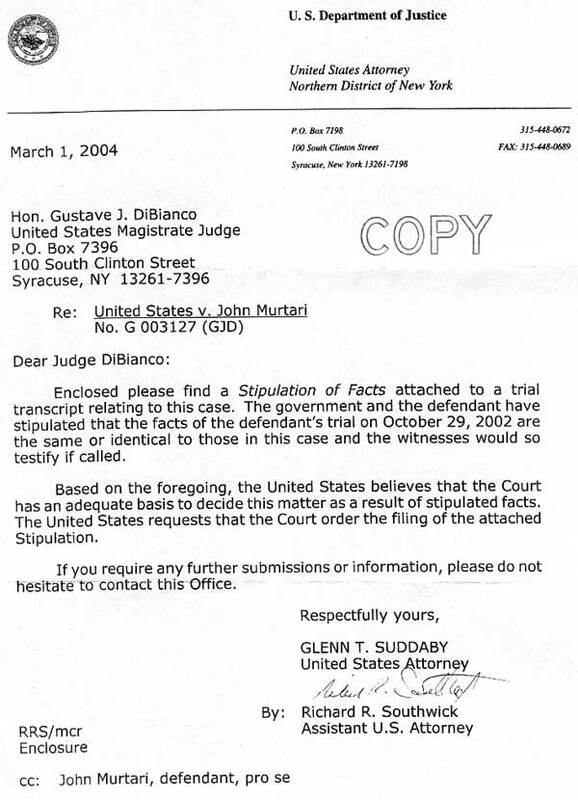 9/30/02 – John sent a letter to US Magistrate Judge DiBianco with his request to subpoena witnesses to testify at his trial on October 9th. He returned to the Federal Building at 1 PM and was arrested by Syracuse City police for trespass. The Federal Police also wrote another ticket for violation of building rules, ticket here. He should be arraigned tomorrow. 9/23/02 – John returned to the Federal Building at 1 PM and proceeded to the 14th Floor where Senator Clinton’s office is located. He again started his walk in the corridor and had continued for app. one hour when US Courthouse Security approached him (which they never had in the past). The officer told John that one of the District Judges had her chambers on that floor and there was some unusual activity going on and would he please leave. He was also told no one was in Clinton’s office, it was closed for the day (no reason given). A Federal police officer was also there and John asked if this was just a “one time thing” and he was told it was. He did as they asked. This was the second time in a week where I have been asked to leave. My initial feeling was to stay as it sounded like the Judge’s staff just didn’t want me around, but they did clarify their request and I had to give them the courtesy to assume it was in good faith. Next Monday I do plan on returning at the same time. 9/19/02 – John returned to the Federal Building. He was detained by building security as usual and they called the City Police to take him to jail. The City told them their had been a shooting. A young boy had been killed and the force was pretty busy. They would not be able to respond till evening. Federal security asked John if he would just go home for the day, that it would make things easier, and just come back next week. He did as they asked. 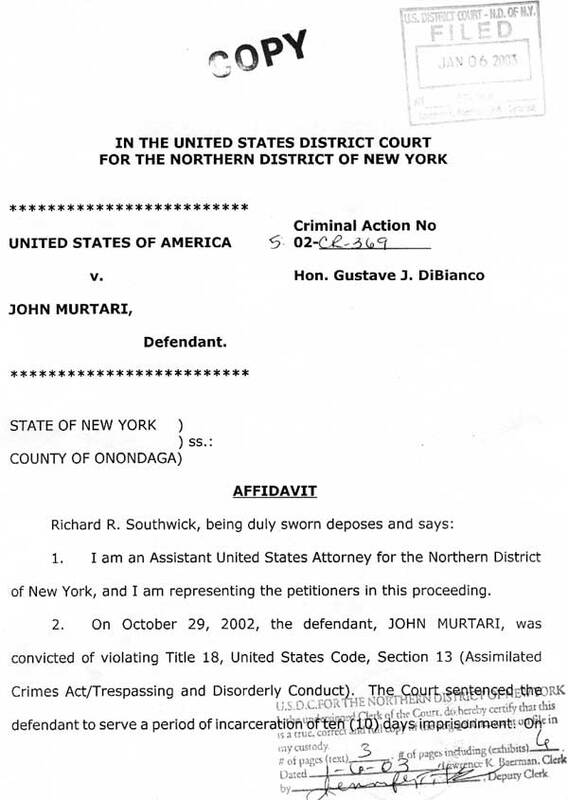 9/18/02 – John appears in front of Federal Magistrate DiBianco for the Northern District of New York. Asst. US Attorney Southwick explains the government’s desire to prosecute the case. The charge is violating building rules. A trial date of Oct 9th at 2pm is scheduled (no jury due to the minor nature of the offense). John ask for assignment of counsel to represent him, completes a financial statement, and expects a decision in the next few days. This appearance (arraignment) lasted over 30 minutes. Mr. Southwick went to some length to explain the history of the case and the government’s desire to now prosecute. I asked the Judge for Counsel. He said he was not sure if I would qualify, but to complete a financial statement for his review and to expect an answer within a week. It was a bit unclear exactly what the charges were against me and Mr. Southwick said his office would prepare a standard detailed complaint and send it to me. I did get a copy of an arrest form and also a narrative report filled out by the officer. The Judge then wanted to set a trial data, I asked for at least a month to get ready. The Judge said he would only grant that if I would agree to stop my activity in the building. I told him I could not do that and a trial date of Oct 9th was set. The Judge told both sides to exchange witness lists by October 2nd. 8/29/02 – John has a preliminary hearing in Syracuse City Court today, 29 Aug, as his attorney moves to have the six pending trespass charges against him dismissed (as they have been about 20 times in the past). This is a new Judge, and of course, nothing is a sure thing. Judge Young was not going to do an informal dismissal and seemed to be ready for a trial. My lawyer asked for a motion date to make a formal motion, that is Oct 10. The judge said “the buck stops here” on this — so I am pretty sure this will eventually go to trial with him and the verdict will be guilty. Trespass is a violation, so there is no jury. Not sure what the max penalty is, but I think it is like a week in jail. 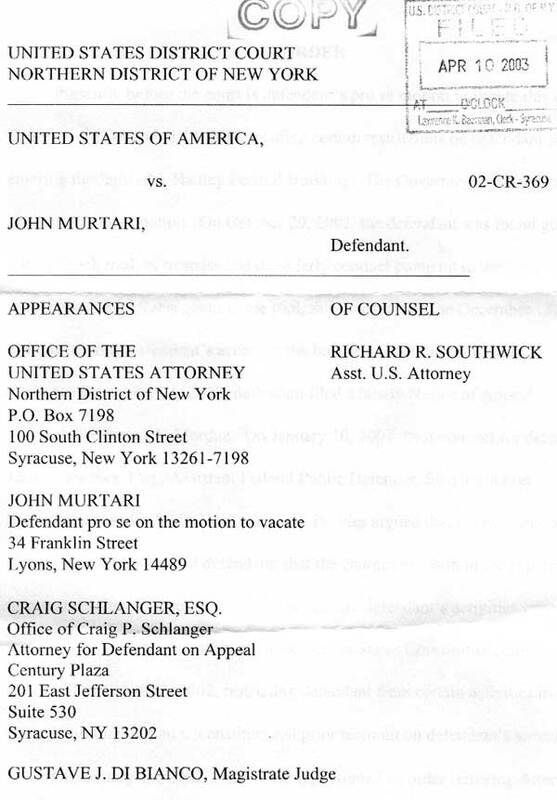 A few days ago John also received notice of his arraignment date in front of a Federal Magistrate in the Syracuse U.S. District Court House for the Northern District of New York. In two other prior occasions these charges were also dismissed, but this time may be different. The date is Sept. 18 at 9:30 AM (anyone interested is welcome to attend. Efforts have been suspended briefly. John and his mom have travel plans to fly out west to spend the weekend with this son, Sep 12-16. 8/22/02 – John returned to the 14th floor and was arrested by Syracuse Police. He was arraigned by Syracuse City Judge McKinney and released. There is a “preliminary hearing” date set for next week August 28th with Judge Young. His attorney will be making a motion to dismiss the six pending arrests. John’s next return date to the building is not scheduled. 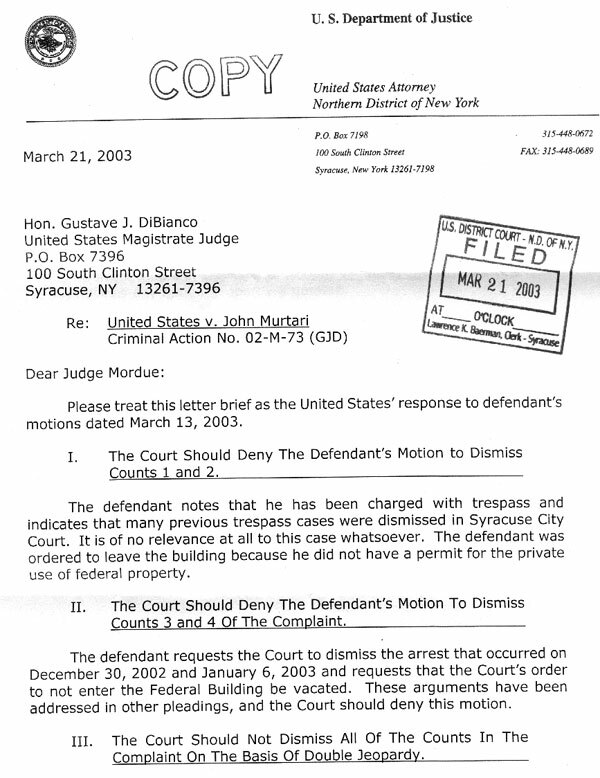 8/21/02 – A letter was sent from John to the Federal Building Manager, asking that no further arrests for trespass be made. 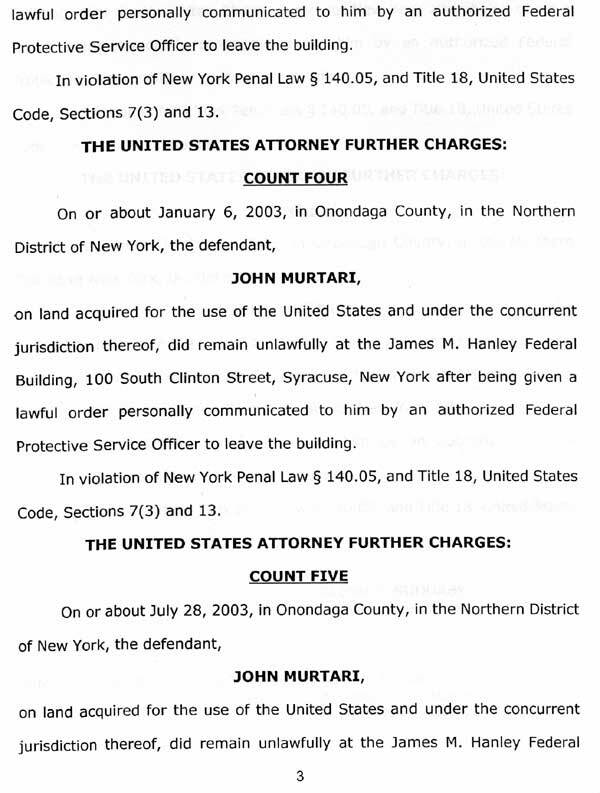 8/15/02 – John returned to the 14th floor and was arrested by Syracuse Police. He was arraigned on Friday (8/16) by Syracuse City Judge McKinney and released. He plans on returning to the building again on Thursday, August 22nd, a 2PM. Your participation is welcome! 8/14/02 – In the past week the effort received a generous $200 donation from Dr. C. Paul Sinkhorn, MD. He also wrote a letter to Senator Clinton we’d like to share with you. 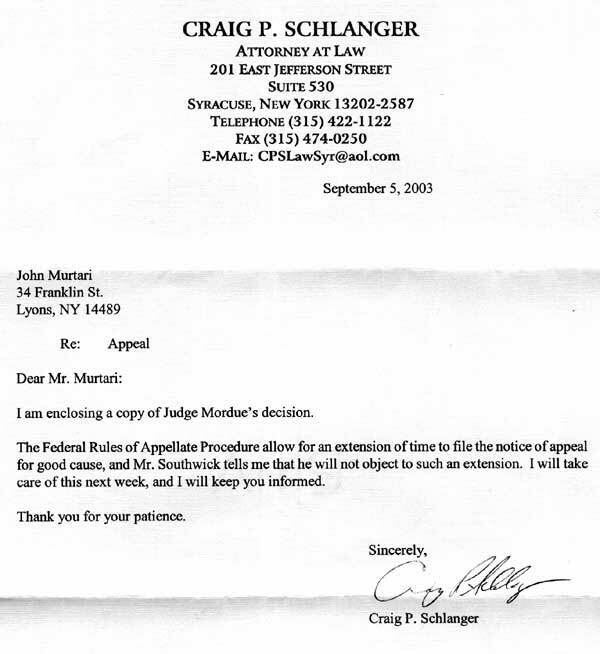 Earlier in the week John also wrote a letter to Judge Merrill, the supervising Judge for Syracuse City Court. 8/9/02 – John was arraigned by Judge Cecille. His assigned council quickly spoke up and said the whole “accusatory instrument” was defective and the charge should be immediately dismissed, that you can’t have trespass in a public building. The DA also spoke up and told the Judge the people preferred to see Mr. Murtari released. That this matter would best be served in motions on the preliminary hearing date of Aug 29th — and that he expected the charges would be dismissed. The Judge asked John if he had received a warning from Judge Young during his last visit and hadn’t Judge Young warned him that a bail would be set if he returned. John told the Judge that Judge Young had said he would hold him in Contempt of Court and jail him immediately. Judge Cecille let John know that he would be doing arraignments on Saturday and that if he saw John, he would set a bail. John was released. He plans on returning to the Building on Thursday, Aug 15th (he will not be returning on Monday due to conflict with a dental appointment for his mother which cannot be delayed). 8/8/02 – John returned to the building at 2pm. He was advised by building security to leave and also by the Federal Police officer, but was allowed to continue his “walk” as they watched. At about 2:30 the Syracuse Police showed up and arrested John for trespass. He will be arraigned on Friday. Many thanks to all of you that sent email and letter/phone calls in support of John — he appreciates it. 8/6/02 – John was arraigned in Syracuse City Court by Judge Kevin Young. The Judge did not appear familiar with the background of the case and appeared frustrated to be seeing the same individual again. He asked the DA if “this person was getting radio transmissions from the building” and was told it was a political matter. After asking John if he “understood english”, he told him to keep away from the building and warned him he would face immediate jail time for contempt if the Judge saw him at another arraignment. John plans on returning to the building on Thursday, Aug 8th, at 2pm. “I had expected they might say stay away, but was surprised when he backed that up with a powerful threat. Contempt could mean an uncontested six months in jail. A much longer sentence than any trespass would bring! When I returned to my office, I decided to write a letter to both the Judge and DA explaining what had happened in the past. I also sent copies to the Building Manager and the offices of Senator Clinton. I hope the Judge will have a better understanding of my motivation and understand that a series of other Judges have found “no trespass”. 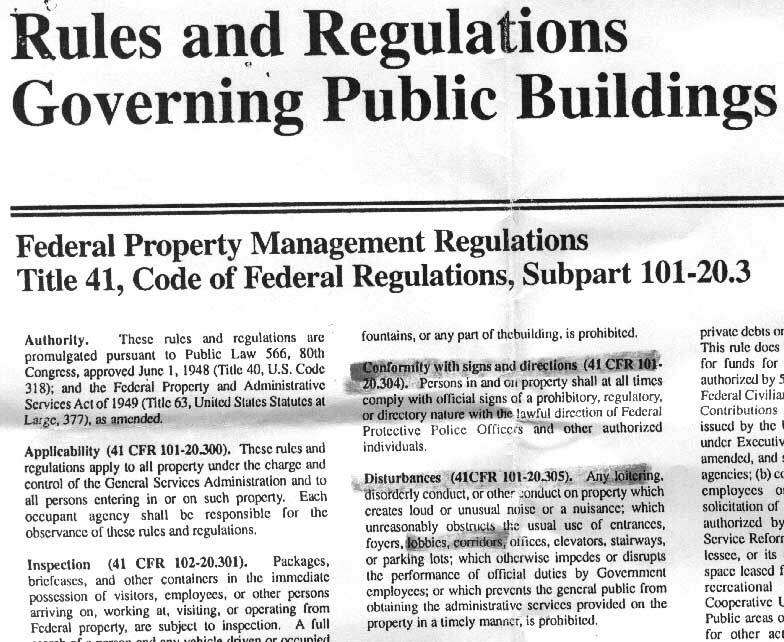 Here is an image of the Federal Building Rules governing conduct. 8/5/02 – John returned to the 14th floor and was told he was in violation of building rules and advised to leave. He was then arrested by Syracuse City Police and charged with simple trespass. Arraignment is scheduled for 8/6/02. 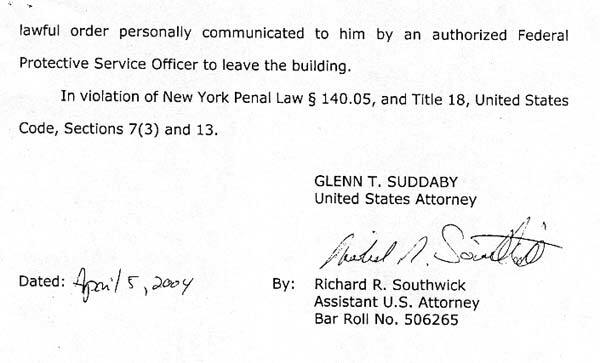 8/1/02 – John returned to the 14th floor and was told he was in violation of building rules and advised to leave. He was then arrested by Syracuse City Police and charged with simple trespass. John was arraigned in Syracuse City Court by Judge Young the next day and released. He plans on returning to the building on Monday, August 5th. 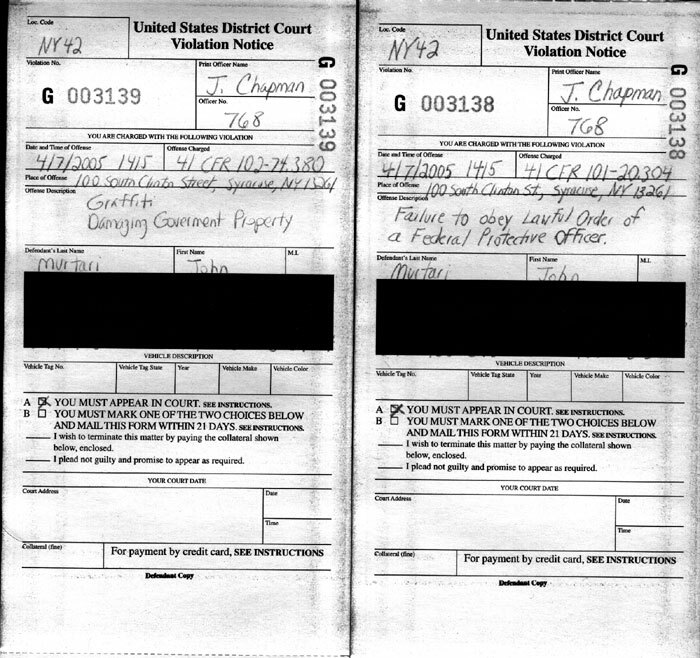 7/30/02 – John was arraigned on “simple trespass” (Newspaper story was incorrect) charges by City Judge Rosenthal and released pending a preliminary hearing on August 29th with City Judge Young. Judge Rosenthal was familiar with the charges and remarked that she had dismissed them in the past and that a similar defense motion for dismissal could probably be made by just changing dates on the prior submission. Check here for image of story which appeared in Syracuse Post Standard. He plans to return to the building on Thursday, August 1st, and every Monday, Wednesday after that. Your participation and support is welcome. Some of the pictures to be carried in building. & Family of Dr. Malcom Hatfield (MD)Mounted front and back on a small card, total size about 7×11 inches. 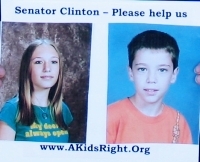 7/29/02 – John Murtari, Mary Jo Marceau-Hawthorne (Macedon, NY), Chris Ranney (Binghamton, NY), and Rich Eichinger (Ft. Wayne Indiana) entered the Federal Building at app 2 PM and went to Senator Clinton’s offices on the 14th floor. Mary Jo, Chris, & Rich presented some letters and had a brief conversation with Kathy Calhoun, the Senator’s Regional Representative. John remained in the hallway carrying a card of pictures as he has done in the past. He was arrested by Federal Police officers for failing to obey building signs regarding “demonstrations” (see ticket), and when he expressed a desire to return to the 14th floor after being “ticketed” the Syracuse City Police were called and he was charged by them with Trespass (a “violation”) and brought to the Justice Center. 7/26/02 – A news release is sent out to national and local media describing the event. 7/25/02 – A copy of the letter sent to Senator Clinton is faxed to the Federal Building manager. John Murtari (group coordinator) includes a note making her aware of the event and asks to be allowed to proceed without interference. He reminds the manager that all charges were dismissed in both Syracuse City, and US District Court. John calls Cathy Calhoun and asks if it will be possible to get a personal meeting of parent’s with the Senator and is told that would not be possible at the present time. He also calls the Senator’s Washington office and leaves a message for Catherine Brown, a legislative aid. 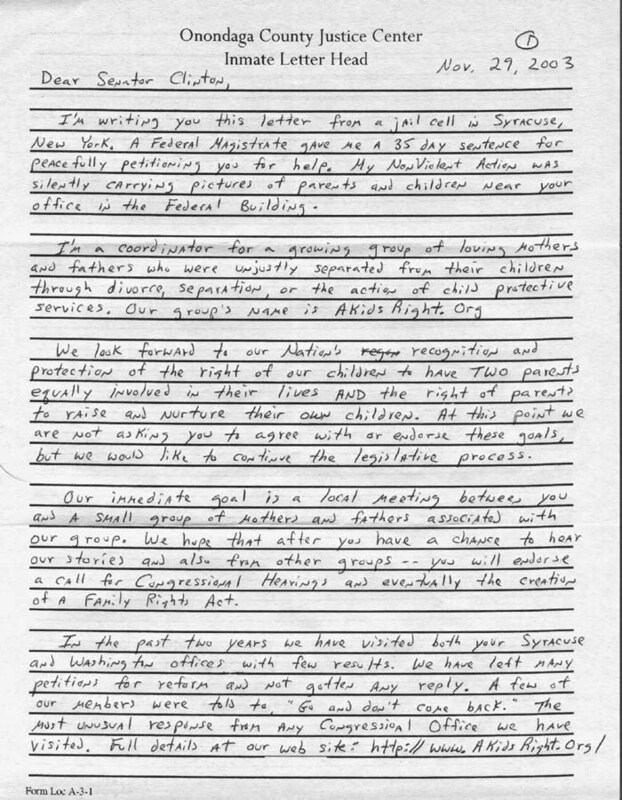 7/23/02 – Letter is faxed to the local and Washington offices of Senator Clinton, describing the problems parents have had in getting “access” to the Senator, and asking her to meet personally with parents hurt by our present system.